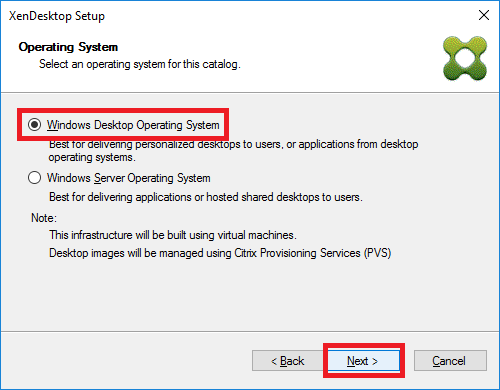 This article will show the same process as the originals but use XenDesktop 7.12, Provisioning Services (PVS) 7.11, and Windows 10 and show what differences they bring to the process. This article will be different than the previous five in that no separate write cache drive will be used. As with most things involving XenDesktop and or PVS, there is NO one way or one right way to do anything. 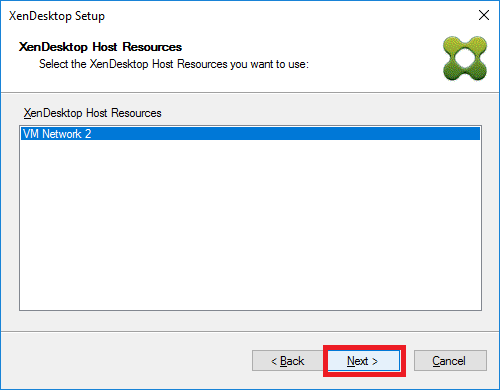 This article will give you detailed information on the process I worked out and documented and now updated for XenDesktop 7.12 and PVS 7.11. PVS 7.11 is installed, configured and a farm created. 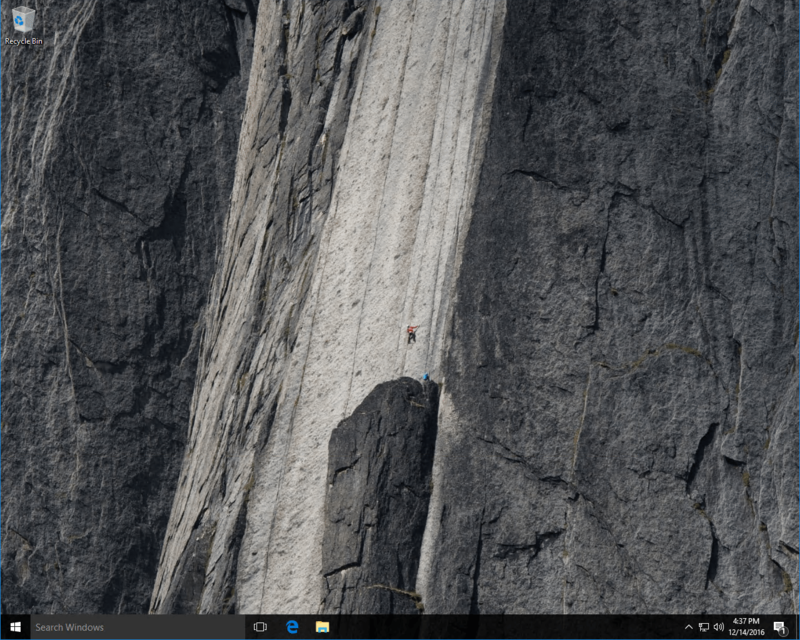 XenDesktop 7.12 is installed, a Site created and configured. Hosting resources are configured in Studio. PXE, TFTP and DHCP are configured as needed. This article is not about the pros and cons of PvD. 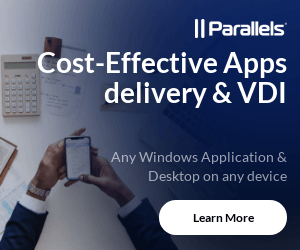 It is simply about what process can be used to create virtual desktops that require the use of PvD. I will not be discussing the overhead of PvD or the delay it brings to the startup, shutdown and restart processes or the I/O overhead, the storage impact or the storage I/O requirements or what is needed for High Availability or Disaster Recovery needs for PvD. 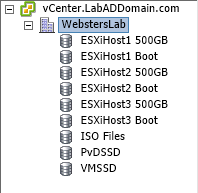 I am using vSphere 6.0.0b for my hosting environment. There are separate Storage Repositories for the Virtual Machines (VM) and PvD as shown in Figure 1. The Hosting Resources are configured in Studio as shown in Figure 2. 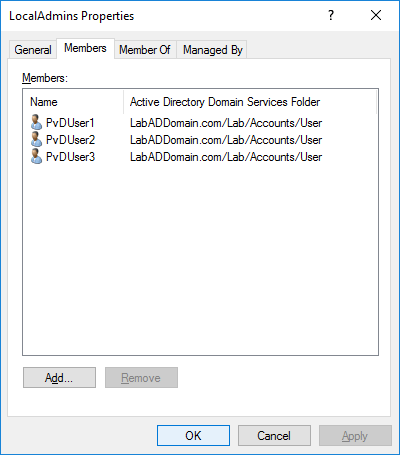 To start off, in my lab I created my Organization Unit (OU) structure in Active Directory (AD) for my domain, LabADDomain.com, as shown in Figure 3. Note: The XenApp/XenDesktop V2.0 documentation script is in development which is why there are so many OUs in Figure 3. 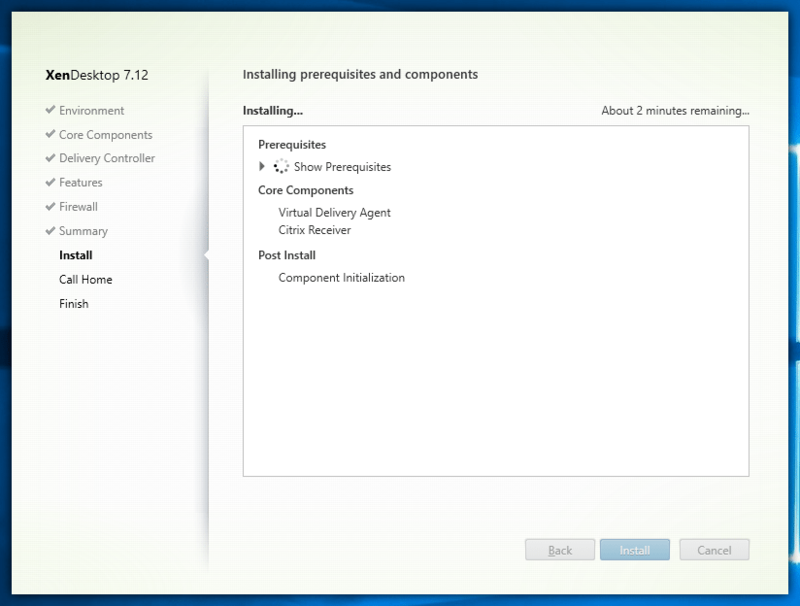 One of the reasons to use PvD is to allow users to install applications. In order to do this, I created an AD security group, shown in Figure 4, that will contain the AD user accounts and that AD security group will be made a member of the local Administrators security group. Three AD user accounts were created, shown in Figure 5, for the three different PvD users for this article. Those three test user accounts were placed in the LocalAdmins AD security group as shown in Figure 6. These are the settings in the group policies used for this lab. Next up is to create a Windows 10 VM to be used as the Master or Golden image. Do just basic configuration of the VM at this time. Do not install any applications at this time. Once the basic VM is built there are some things that need done before joining the VM to the domain. Configure the pagefile so the Minimum and Maximum size are the same number. I use 1024KB. 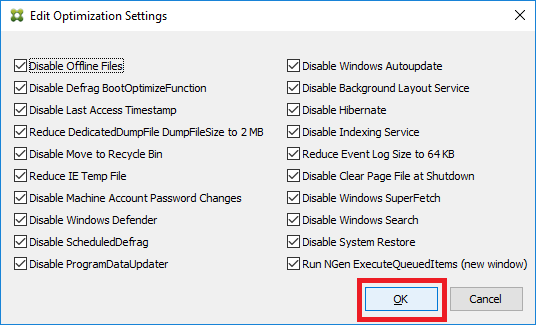 Verify the network connection is not Public, and then from an elevated command prompt, run WinRM QuickConfig. 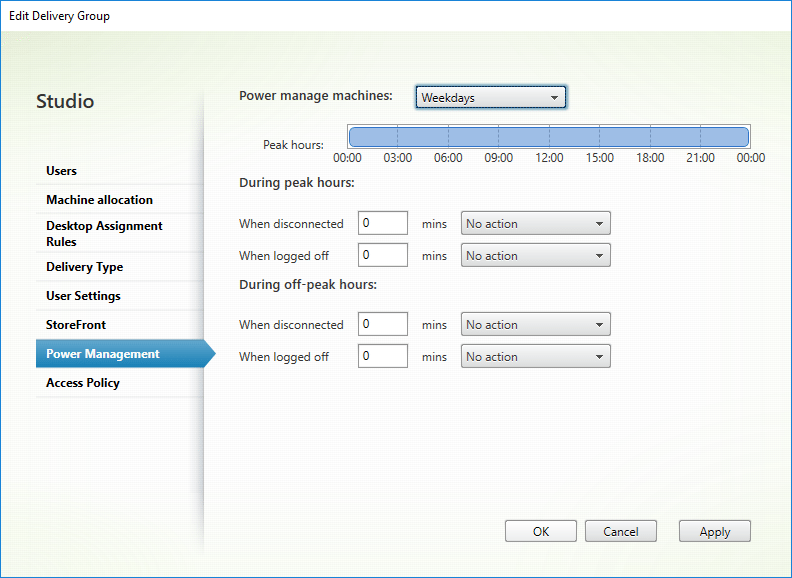 Disable all Network Interface Power Management settings as shown in Figure 7. 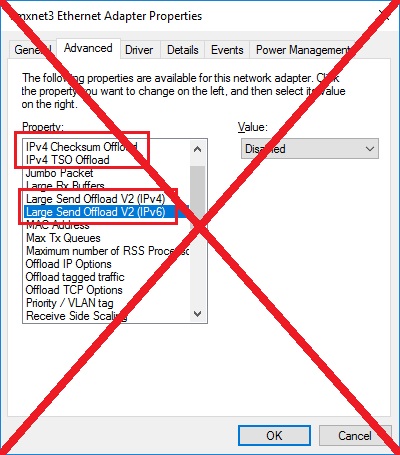 Disable all Network Interface Offload settings that end in Offload as shown in Figure 8 and 9. #1 is done to keep disk I/O down and improve performance since the page file will not constantly grow and shrink. #2 is done because without it, neither Director nor Scout will work with the desktops created from the VM. #3 is a recommendation from Best Practices for Configuring Provisioning Services Server on a Network. #4 will keep desktop from going to sleep or becoming unresponsive when the network card is powered off to save power. In light of this information, item 5 in the list above is now redundant. The VM is ready to join the domain. 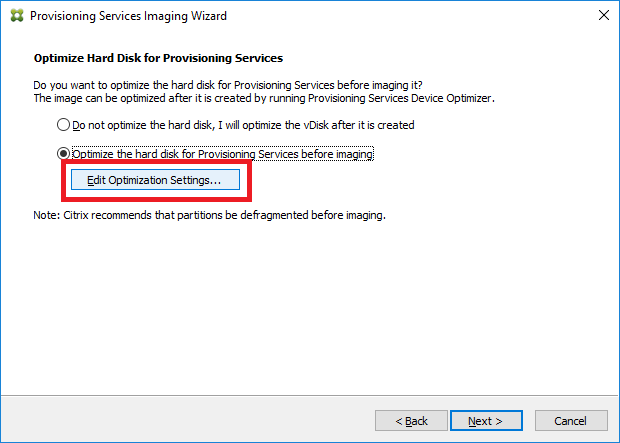 After joining the domain, follow the guidance in the Citrix Windows 10 Optimization Guide to optimize the master image. At this time, any software and updates needed can be installed. After all software and updates are installed, mount the PVS 7.11 ISO to the VM, open My Computer and double-click the CD. 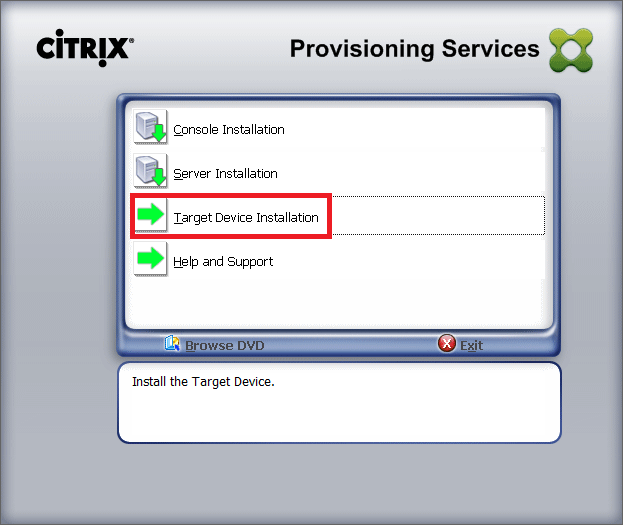 When the PVS installer starts, click Target Device Installation on both screens as shown in Figures 10 and 11. 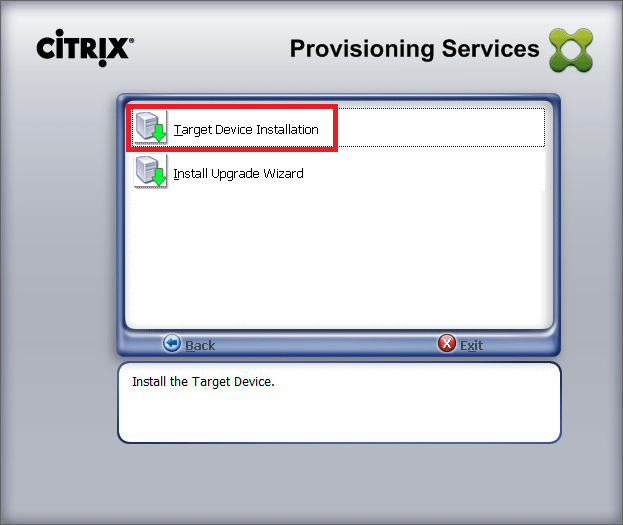 Follow the Installation Wizard to install the PVS Target Device Software. 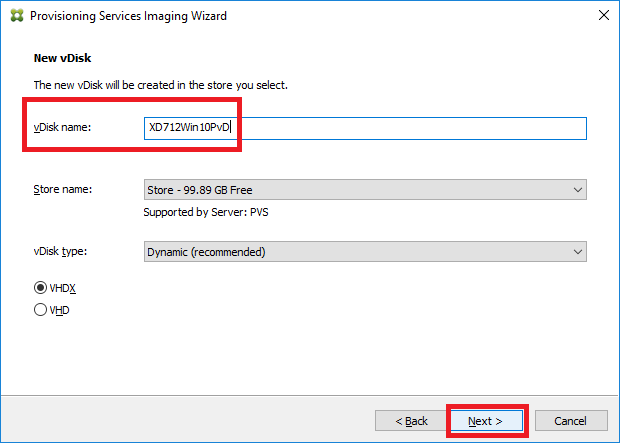 On the last page of the Installation Wizard, leave Launch Imaging Wizard selected and click Finish as shown in Figure 12. 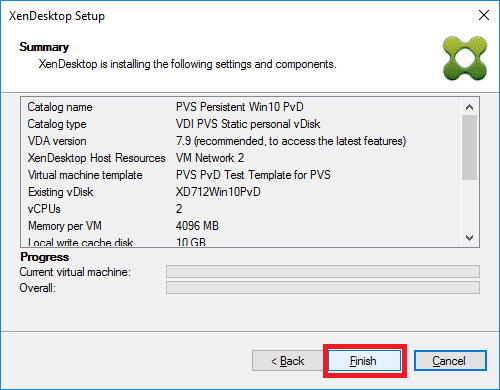 You can exit the PVS Installer screen and unmount/disconnect the PVS 7.11 ISO from the VM’s CD drive. Click Next on the Imaging Wizard as shown in Figure 13. 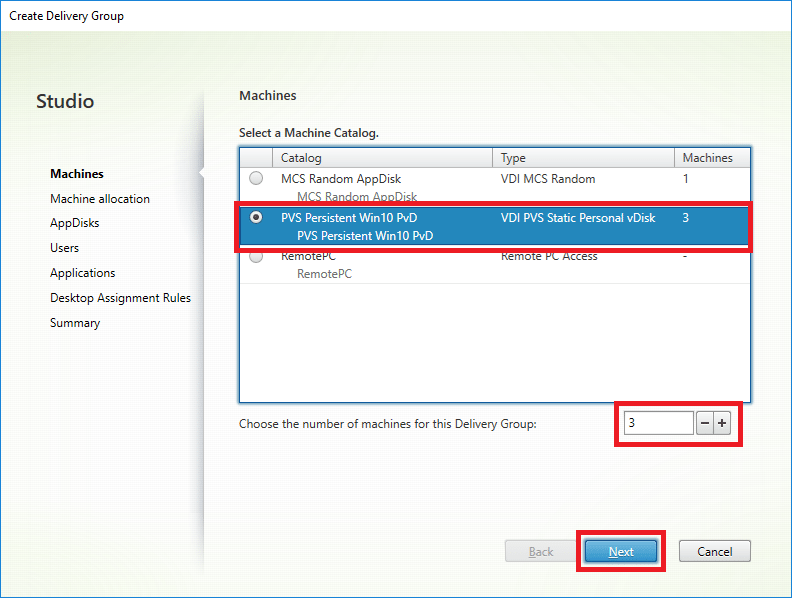 Enter the name or IP address of a PVS Server, select the option for Credentials and click Next as shown in Figure 14. To Create a vDisk, click Next as shown in Figure 15. Enter a Target device name, select the MAC address, select the target device Collection name and click Next as shown in Figure 16. 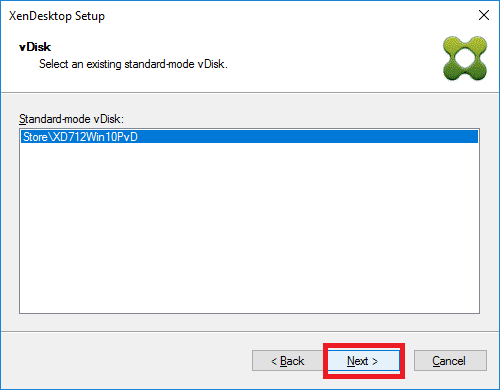 Enter a vDisk name, Store name, vDisk type, VHDX or VHD and click Next as shown in Figure 17. Click Next as shown in Figure 18. Note: There is no need to select KMS or MAK at this time. The licensing type will be selected when the vDisk is placed into Standard Image mode. 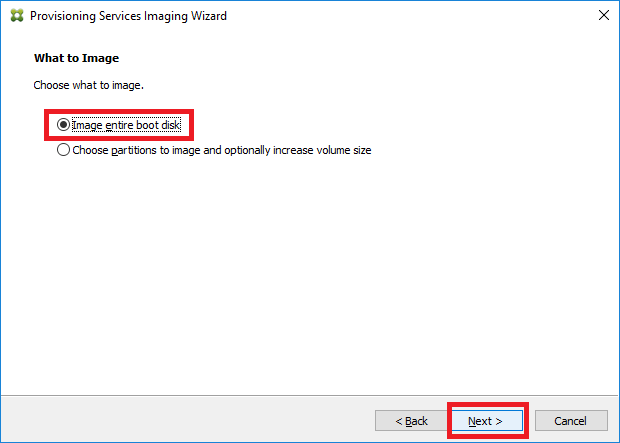 Select Image entire boot disk and click Next shown in Figure 19. 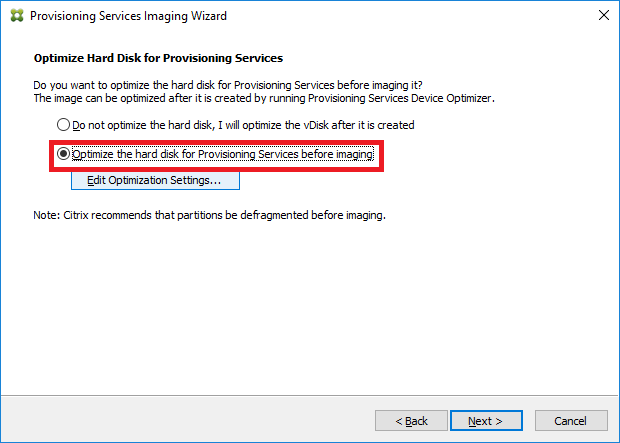 Select Optimize the hard disk for Provisioning Services before imaging as shown in Figure 20. Select Edit Optimization Settings… as shown in Figure 21. 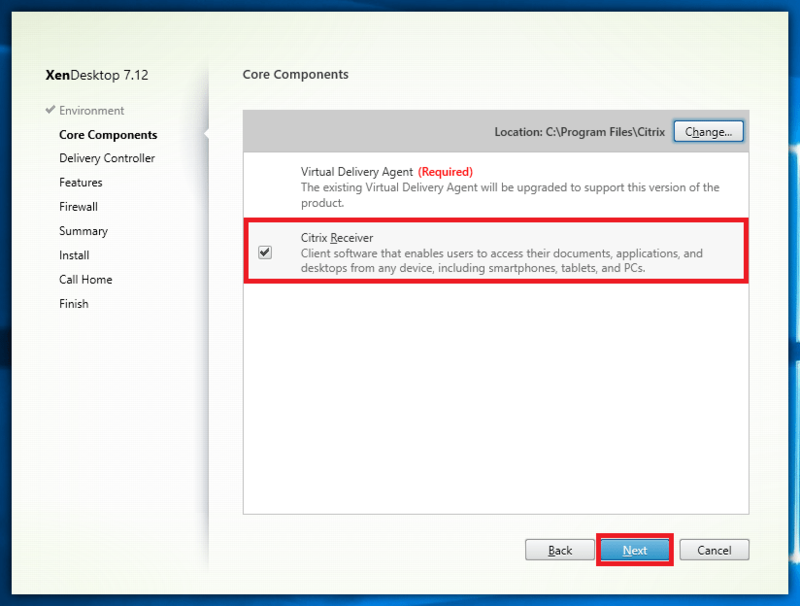 Verify all checkboxes are selected and click OK as shown in Figure 22. Click Next as shown in Figure 23. Verify all the settings are correct in the Summary screen. If any settings are not correct, click Back and correct the settings. If all the settings are correct, click Create as shown in Figure 24. Depending on the .Net Framework versions installed in the VM, the optimization process could take from less than a second to over an hour. 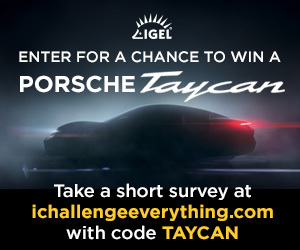 Click Continue as shown in Figure 25. A Reboot popup appears as shown in Figure 26. DO NOT reboot at this time. Depending on your hypervisor, you may need to shutdown to make the next change. The VM needs to be configured to boot from the network first and the hard drive second. If this change can be made while the VM is running, make the change and click Yes. 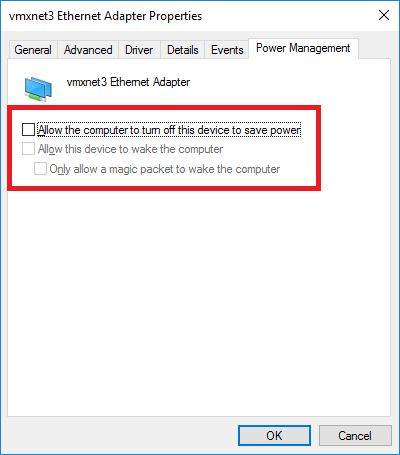 If not, click No, and click Yes on the next popup as shown in Figure 27 to shutdown the VM, make the change and power the VM on to continue. 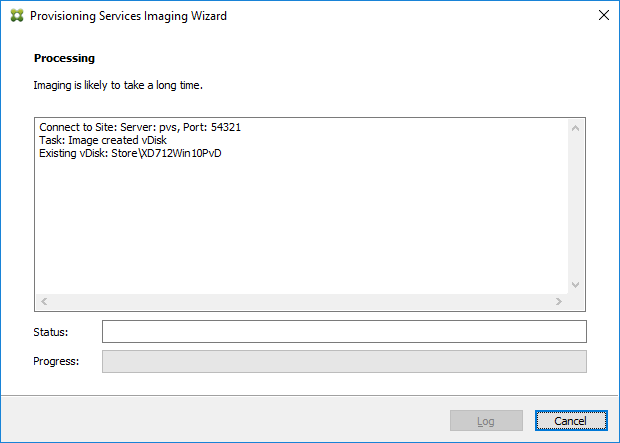 Before we continue, what did the Imaging Wizard do inside of PVS? First, a vDisk was created as shown in Figure 28. Second, a Target Device was created, as shown in Figure 29, with the MAC address of the VM, linked to the vDisk just created and the Target Device is configured to boot from its hard disk because the vDisk is empty right now. 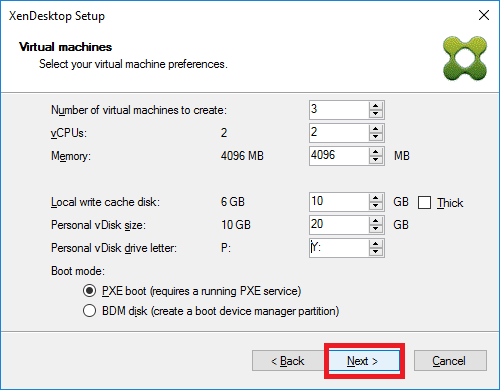 Once the VM has been configured to boot from the network first and the hard drive second, either power on the VM or click Yes to reboot the VM as previously shown in Figure 26. 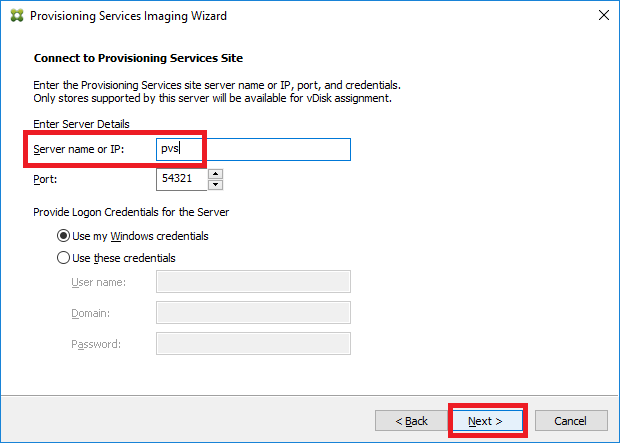 When the VM is at the logon screen, logon with the same domain account and the Imaging Wizard process continues as shown in Figure 30. 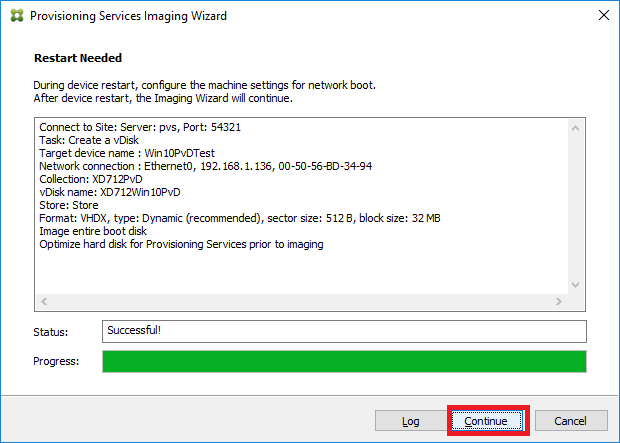 When the Imaging Wizard process is complete, click Done, as shown in Figure 31, and shutdown the VM. 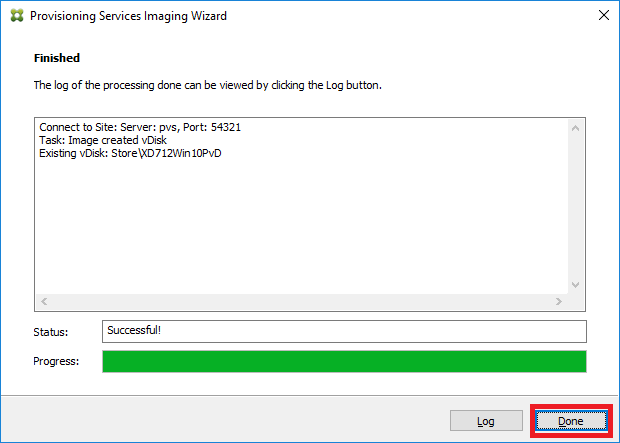 Note: If there are any errors, click Log, review the log, correct any issues and rerun the Imaging Wizard. 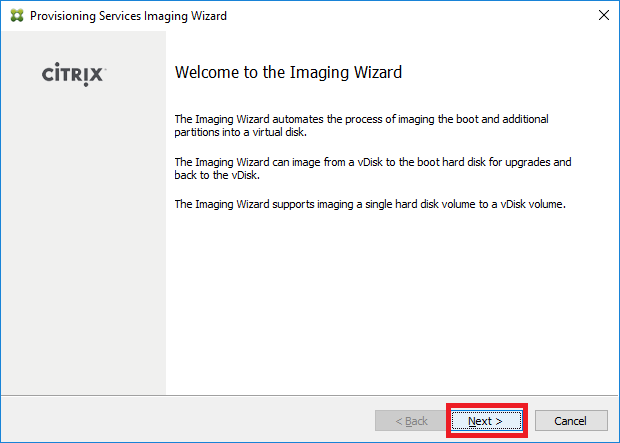 What has happened is that the Imaging Wizard has now copied the contents of the VM’s C drive into the vDisk. That means the C drive attached to the VM is no longer needed. Detach the C drive from the VM as shown in Figures 32 and 33. DO NOT DELETE the C drive, just detach it. Now that the VM has no C drive, how will it boot? In the PVS console, go to the Target Device, right-click and select Properties as shown in Figure 34. 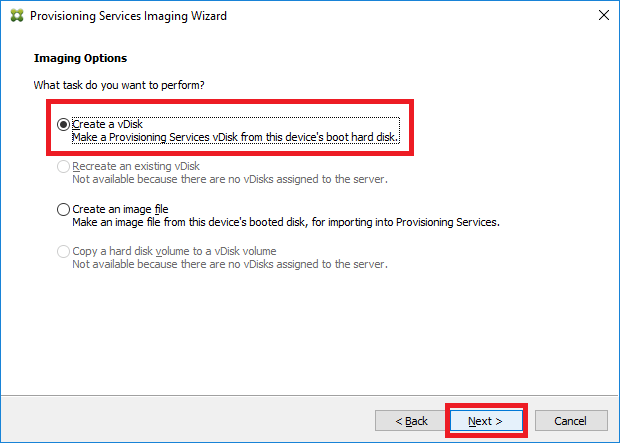 Change the Boot from to vDisk as shown in Figure 35. The vDisk contains everything that was on the original C drive and the vDisk is still set to Private Image mode. That means everything that is done to the vDisk is the same as making changes on the original C drive. Any changes made now will persist. When the vDisk is changed to Standard Image mode, the vDisk is placed in read-only mode and no changes can be made to it. Before the VM is powered on, an AD Machine Account must be created. 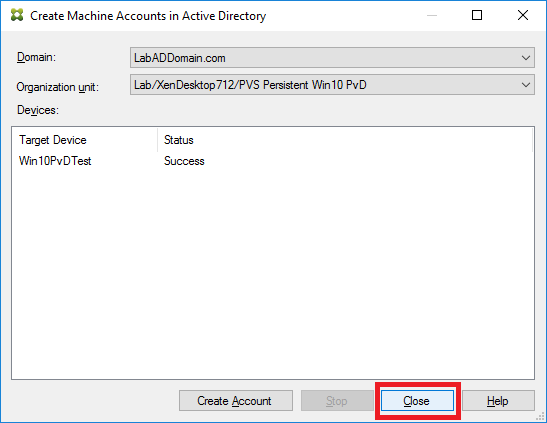 Right-click the target device, select Active Directory and then Create Machine Account… as shown in Figure 36. Select the Organization unit from the dropdown list as shown in Figure 37. Once the correct Organization unit has been selected, click Create Account as shown in Figure 38. When the machine account is created, click Close as shown in Figure 39. If there is an error reported, resolve the error and rerun the process. 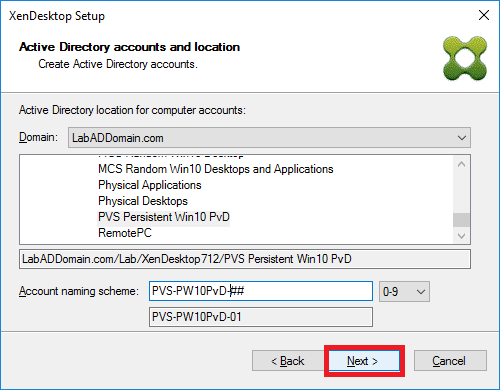 Power on the VM and logon with domain credentials. 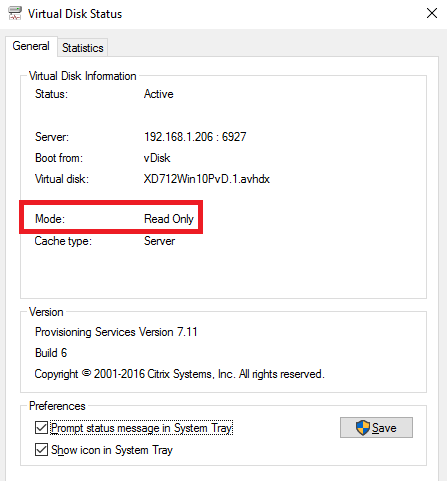 You can verify the VM has booted from the vDisk by checking the Virtual Disk Status icon in the Notification Area as shown in Figure 40. The vDisk is in Read/Write mode. Exit the Virtual Disk Status. 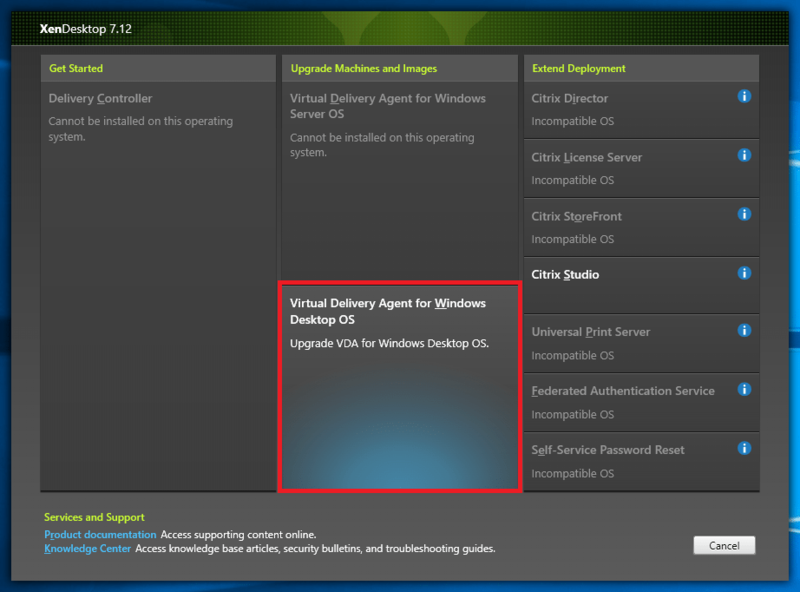 The XenDesktop 7.12 Virtual Delivery Agent (VDA) needs to be installed. Mount the XenDesktop 7.12 ISO to the CD. 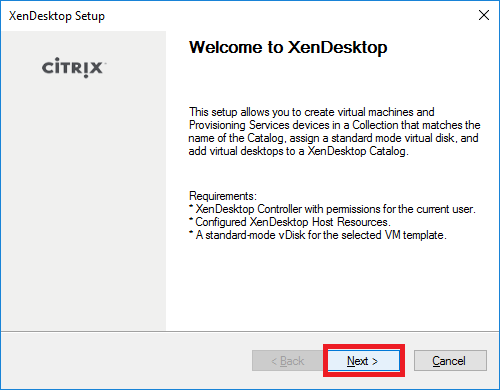 Double-click the CD drive and the XenDesktop installation wizard starts. 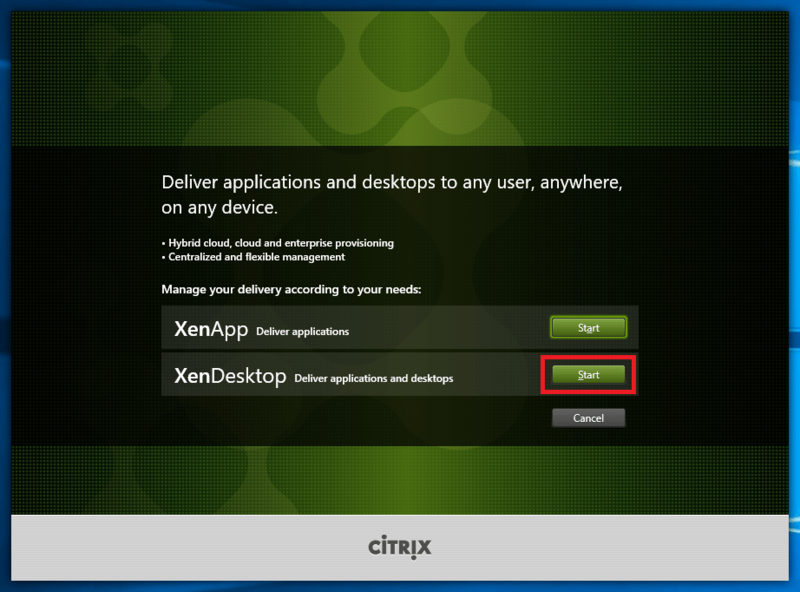 Click Start for XenDesktop as shown in Figure 42. Note: At this time, PvD is only supported for desktop operating systems. 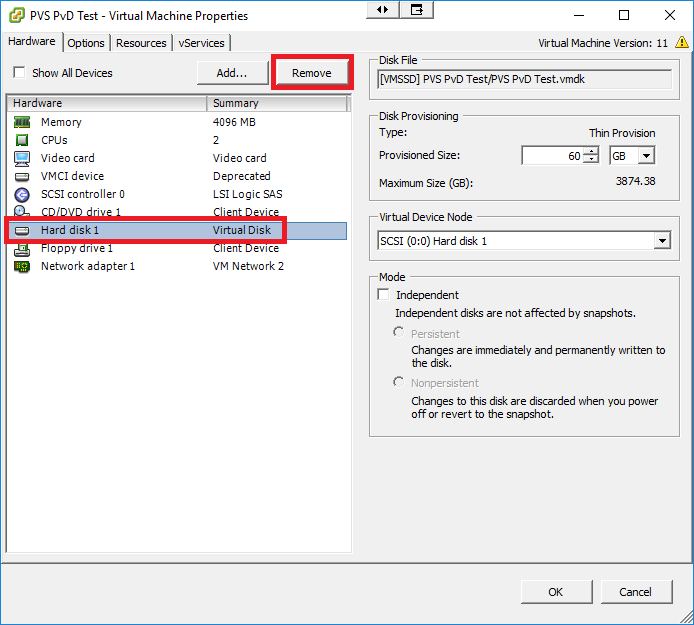 PvD will not work and is not supported for XenApp 7.12. 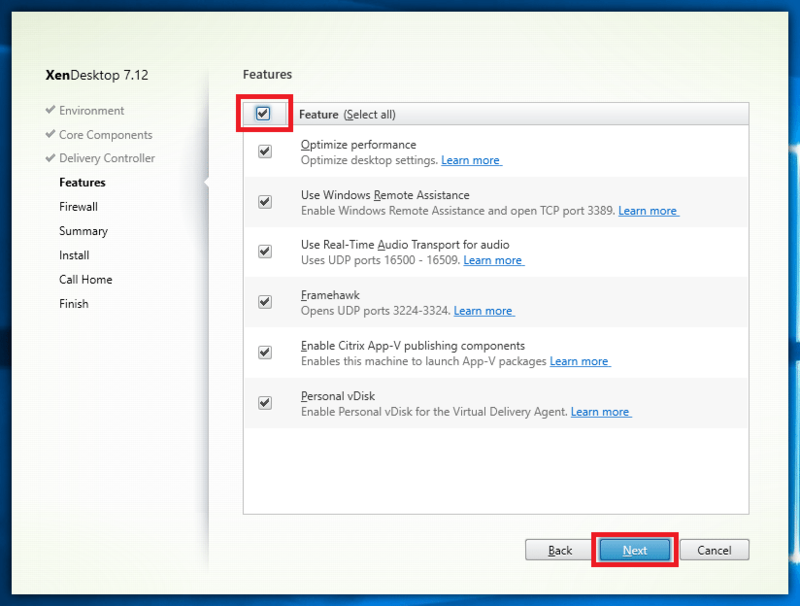 Select Virtual Delivery Agent for Windows Desktop OS as shown in Figure 43. 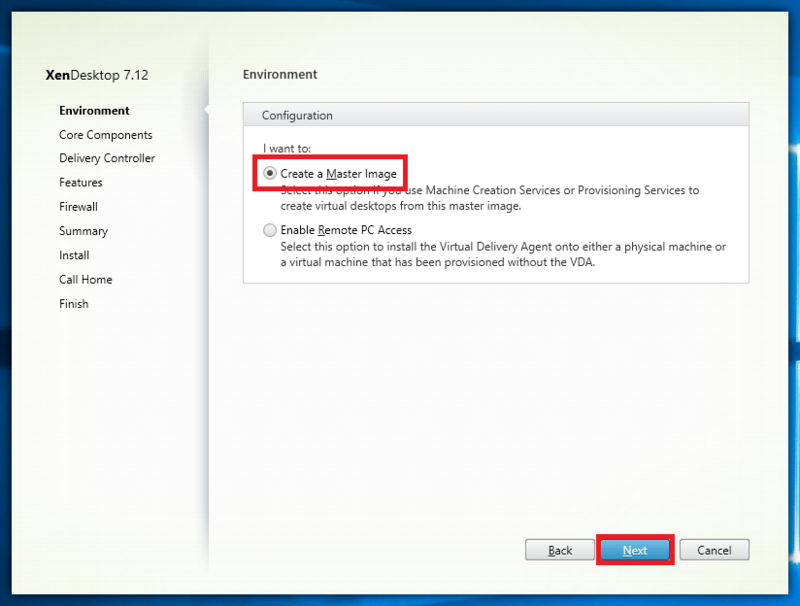 Select Create a Master Image and click Next as shown in Figure 44. 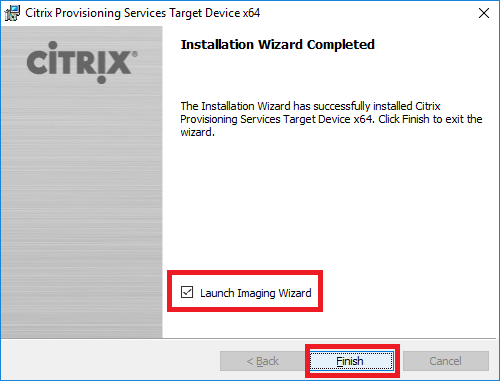 Verify Citrix Receiver is selected and click Next as shown in Figure 45. 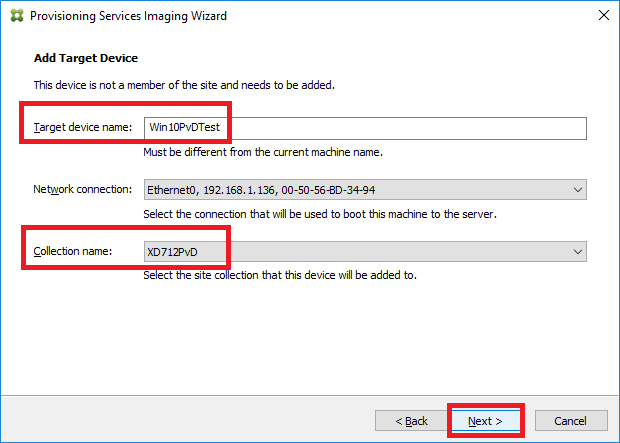 Enter the Fully Qualified Domain Name of a XenDesktop 7.12 Controller, click Test connection and, if the test is successful (a green check mark is displayed), click Add as shown in Figures 46 and 47. Note: In my lab, I had to click Add before it “lit up” and was available for a real click. 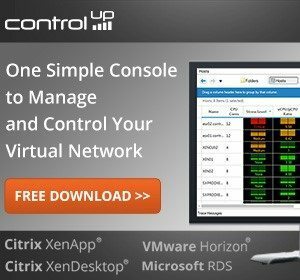 Repeat until all XenDesktop 7.12 Controllers are entered. Click Next when all Controllers are added. Unlike previous VDA versions, the 7.12 VDA requires the selection of the appropriate options. I recommend you select all options since they are all installed regardless of what you select on this screen. Click Next as shown in Figure 48. 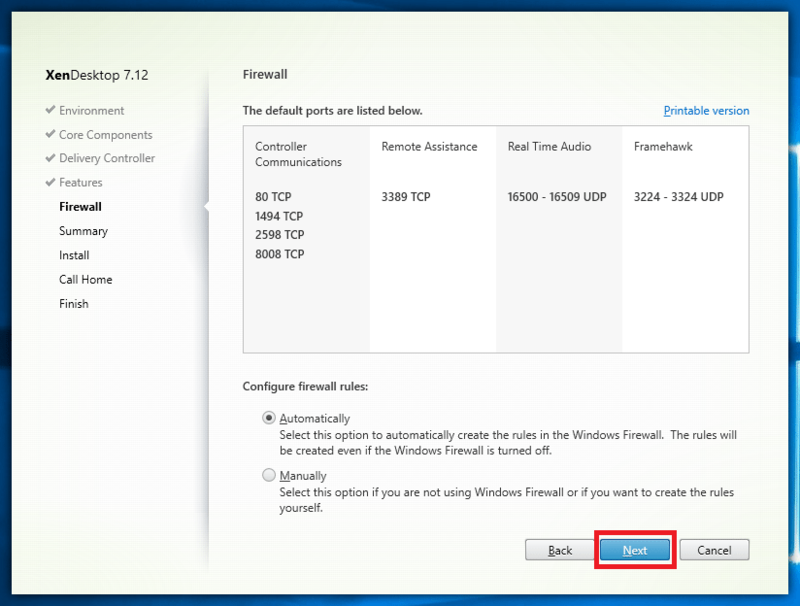 Select the appropriate firewall rules option and click Next as shown in Figure 49. 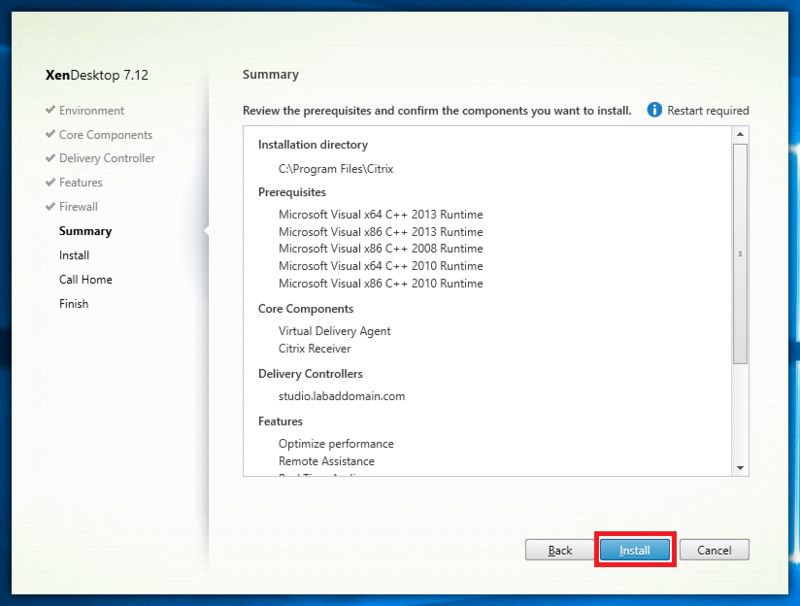 Click Install as shown in Figure 50. The VDA installation starts as shown in Figure 51. 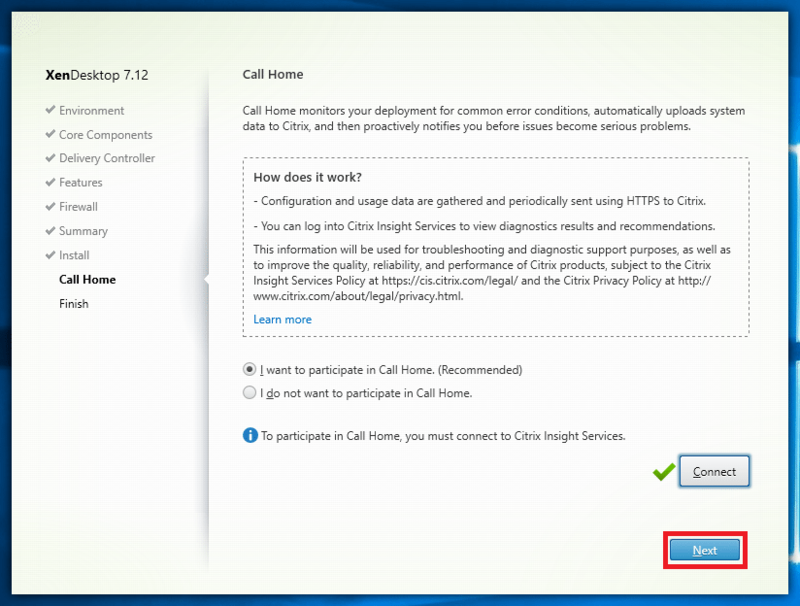 When the VDA installation completes, you have the option to participate in the Call Home feature as shown in Figure 52. Select the appropriate option and when complete, click Next as shown in Figure 53. Verify Restart machine is selected and click Finish as shown in Figure 54. Note: This value must be changed before the PvD is placed into production. Everything is now complete. Before running the PvD Inventory, follow your standard procedure for sealing the image. This process is unique to every environment. For my lab, I have no antivirus software and I am not using WSUS so I have no registry keys to clear out. 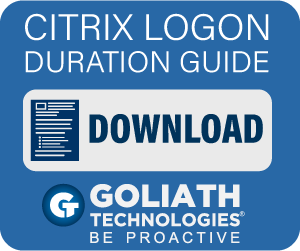 You should make sure you follow the Citrix recommendations for antivirus software for all Citrix components. This is the point where you will also configure KMS licensing for Windows and Office. 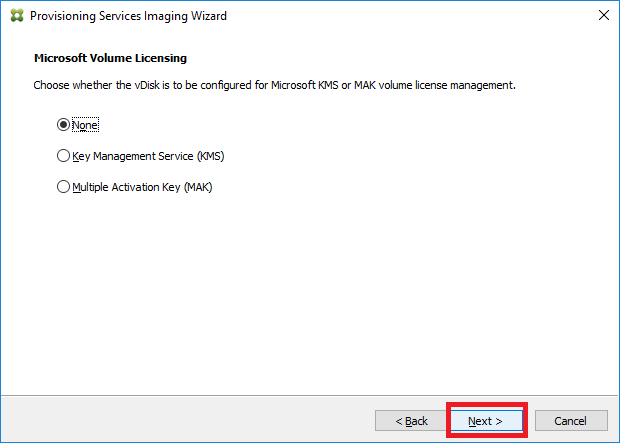 Please follow the instructions from Citrix in Configuring KMS Licensing for Windows and Office 2010 and 2013. Manually run the PvD Inventory. 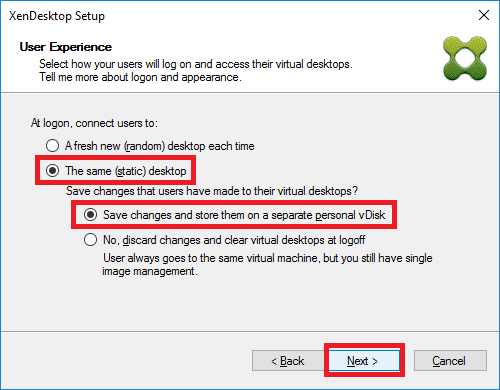 Click Start, Citrix, Update personal vDisk as shown in Figure 55. 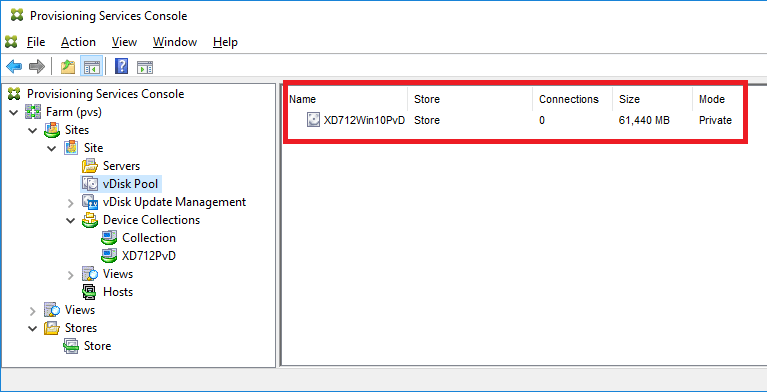 Note: If you are following Scenario 1 in the Citrix article, run the PvD Inventory at Step 5 and allow the inventory process to shut down the computer. The PvD inventory starts. Leave Shut down the system when update is complete selected as shown in Figure 56. 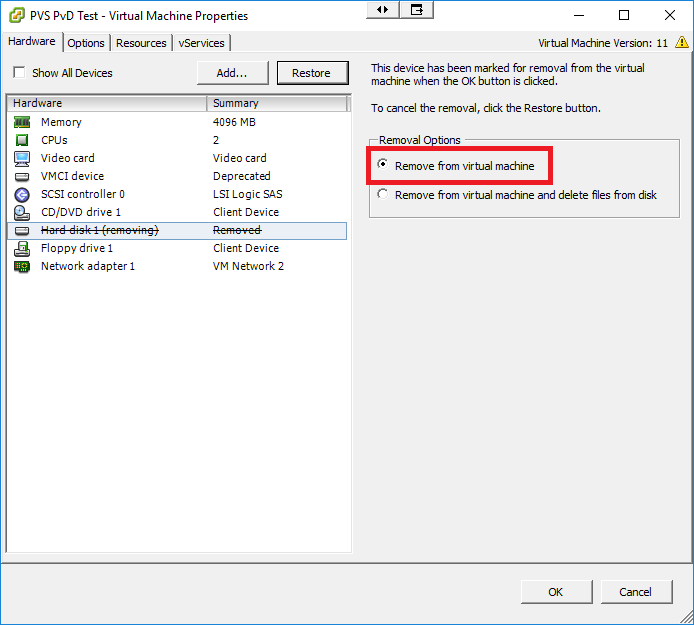 After the inventory completes, click Yes to shut down the VM as shown in Figure 57. Make a copy of the VM and create a template of the copy. That way the original VM is still available just in case. Change either the original VM or the template to boot from network only (depends on your hypervisor). When making the template, make sure the template is stored on a storage location that is available when running the XenDesktop Setup Wizard. If you do not, an error ” has no available templates defined that are fully accessible by all hosts” is displayed during the XenDesktop Setup Wizard. In the PVS console, click on the vDisk Pool node, right-click the vDisk and select Properties as shown in Figure 58. 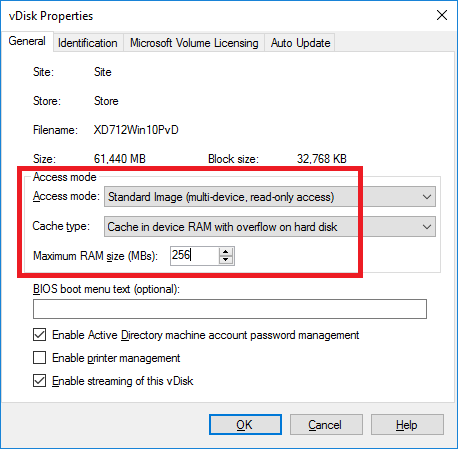 Change the Access mode to Standard image, leave the Cache type at the default of Cache in device RAM with overflow on hard disk and change Maximum RAM size to 256 as shown in Figure 59. 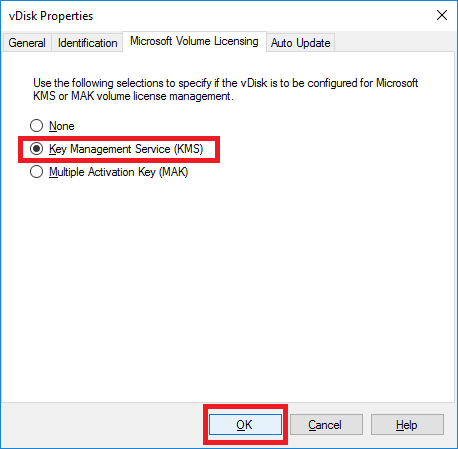 If you are using Microsoft KMS licensing, click the Microsoft Volume Licensing tab, select Key Management Service (KMS) and click OK as shown in Figure 60. Note: If you get an error message, make sure the account used for the Citrix Stream and SOAP services is a member of the local Administrators group. 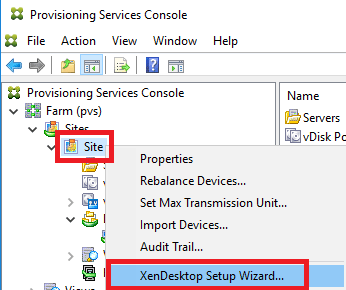 Right-click the Site and select XenDesktop Setup Wizard… as shown in Figure 61. Note: If you get an error popup that states “No Standard Image vDisk exists in this Site”, that simply means the vDisk is still in Private Image mode. Click Next as shown in Figure 62. 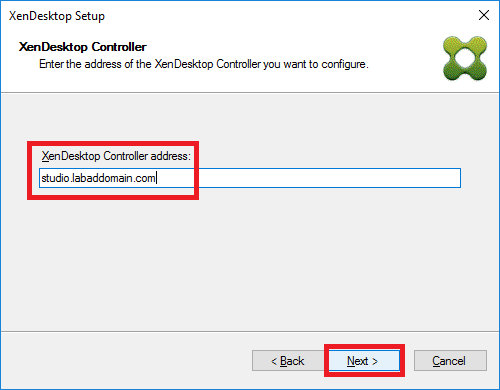 Enter the name of a XenDesktop 7.12 Controller and click Next as shown in Figure 63. 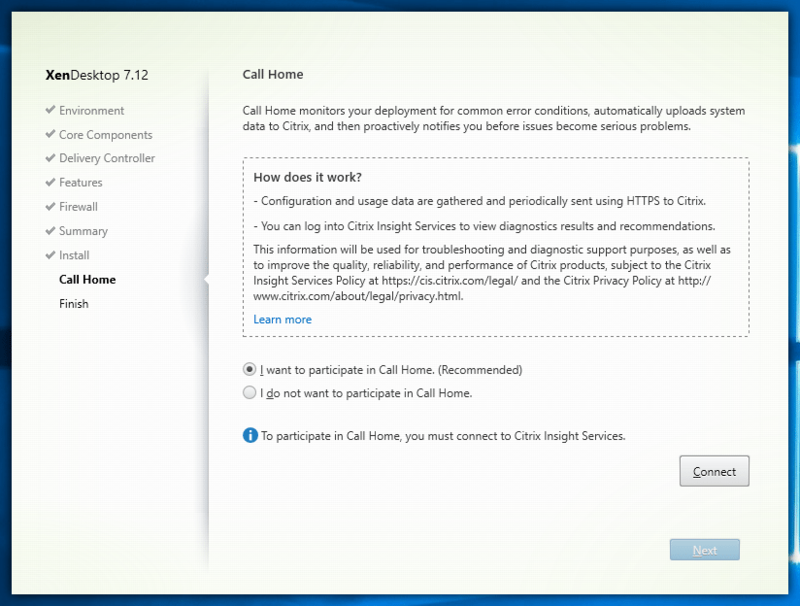 Select the host resources from those configured in Citrix Studio and click Next as shown in Figure 64. Enter the logon credentials for the host resources and click OK as shown in Figure 65. Select the appropriate template and VDA version and or functionality desired and click Next as shown in Figure 66. Select the vDisk and click Next as shown in Figure 67. Select whether to Create a new catalog or Use an existing catalog and click Next as shown in Figure 68. If you Create a new catalog, enter a Catalog name and Description. 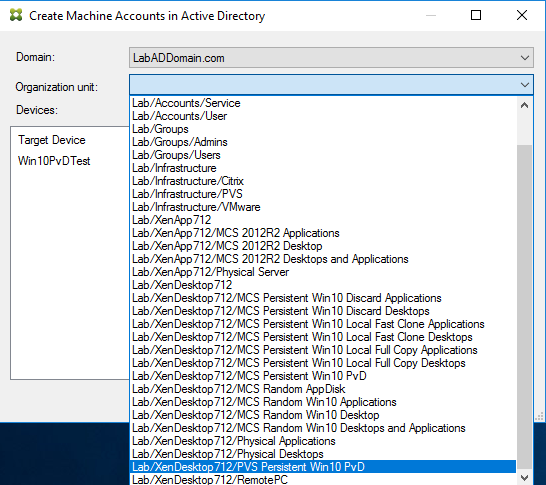 Note: The wizard creates a Machine Catalog in XenDesktop and a Device Collection in PVS with the Catalog name entered here. Select Windows Desktop Operating System and click Next as shown in Figure 69. 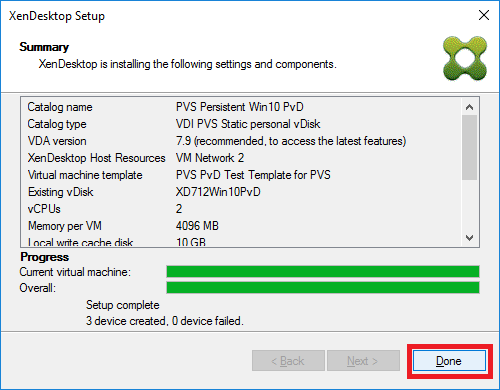 Since we are using PvD, select The same (static) desktop, also select Save changes and store them on a separate personal vDisk and click Next as shown in Figure 70. Make the appropriate choices. For this lab, I am creating 3 VMs (desktops) with 2 vCPUs, 4 GB RAM, a 10GB write cache disk, a 20 GB PvD disk and changing the PvD drive to Y. Click Next as shown in Figure 71. 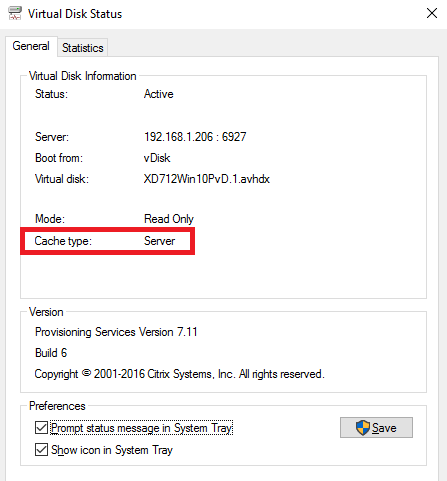 Note: If you do not see the option Local write cache disk that means the vDisk cache setting is Cache on server. Exit this wizard, correct the vDisk properties and rerun the wizard. 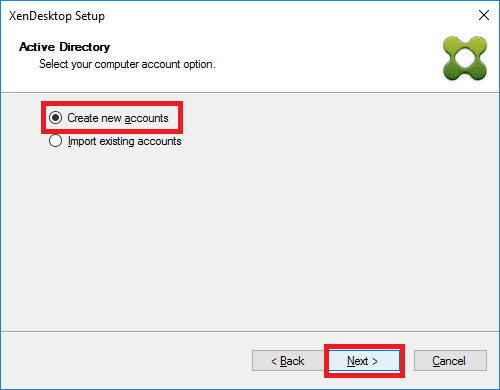 Select Create new accounts to have new AD computer accounts created and click Next as shown in Figure 72. 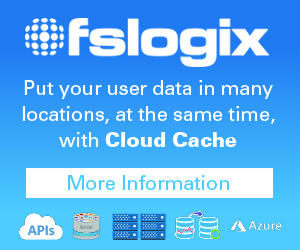 Select the Domain, OU, Account naming scheme and click Next as shown in Figure 73. When the wizard is complete, click Done as shown in Figure 75. 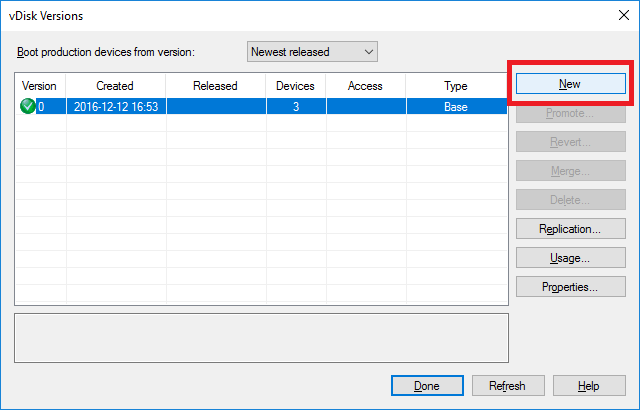 Looking at the new Device Collection in the PVS console (you may need to right-click the Farm and select Refresh) shows the three target devices with one or more powered on at this time as seen in Figure 76. Looking in Active Directory Users and Computers shows the new computer accounts as seen in Figure 77. 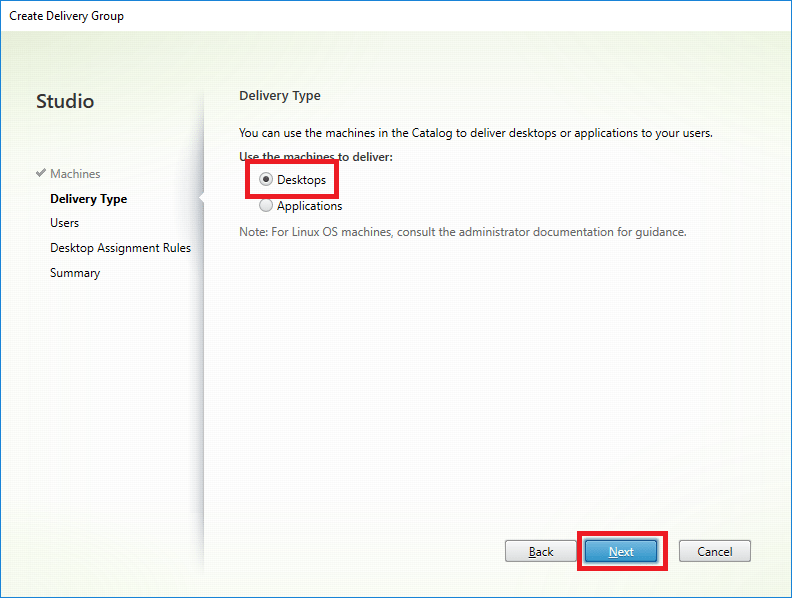 In Citrix Studio, right-click on the Machine Catalogs node and select Refresh. The new Machine Catalog created by the XenDesktop Setup Wizard is shown in Figure 78. Currently there is no Delivery Group to deliver the desktops. 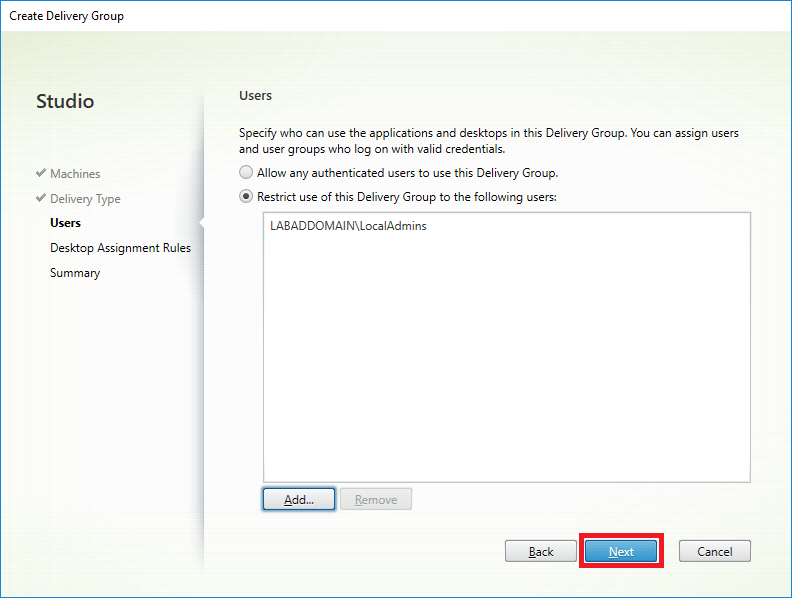 Right-click the Delivery Groups node in Citrix Studio and select Create Delivery Group as shown in Figure 79. Select the Machine Catalog and the number of machines to be added from the catalog to this delivery group and click Next as shown in Figure 80. 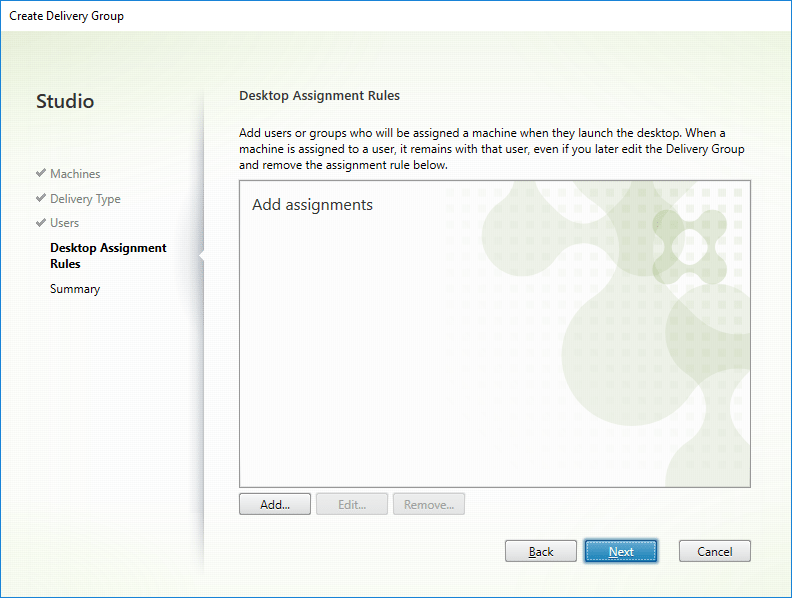 Select Desktops and click Next as shown in Figure 81. Only the LocalAdmins security groups needs access to this Delivery Group. 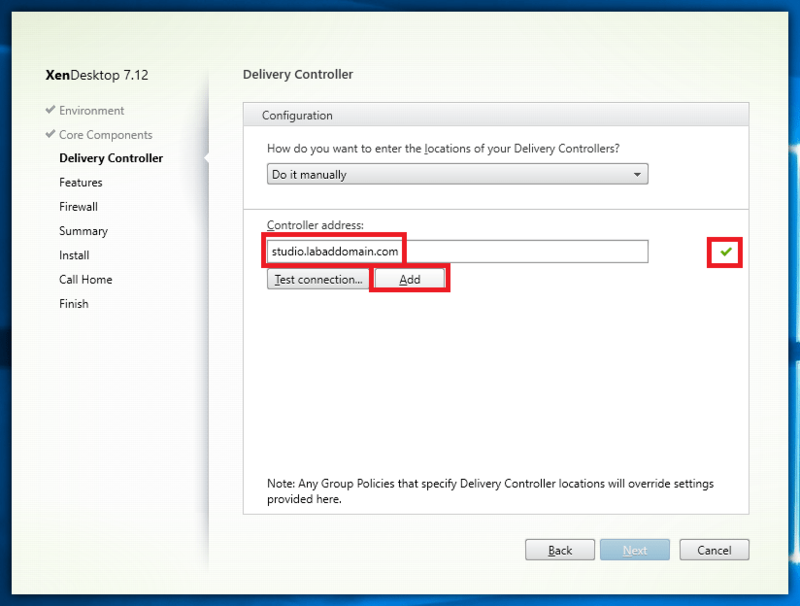 Click Restrict use of this Delivery Group to the following users and click Add… as shown in Figure 82. 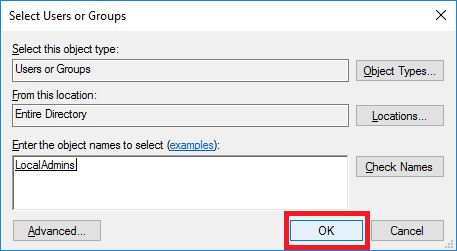 Use the Select Users or Groups dialog to add users and click OK as shown in Figure 83. Click Next as shown in Figure 84. 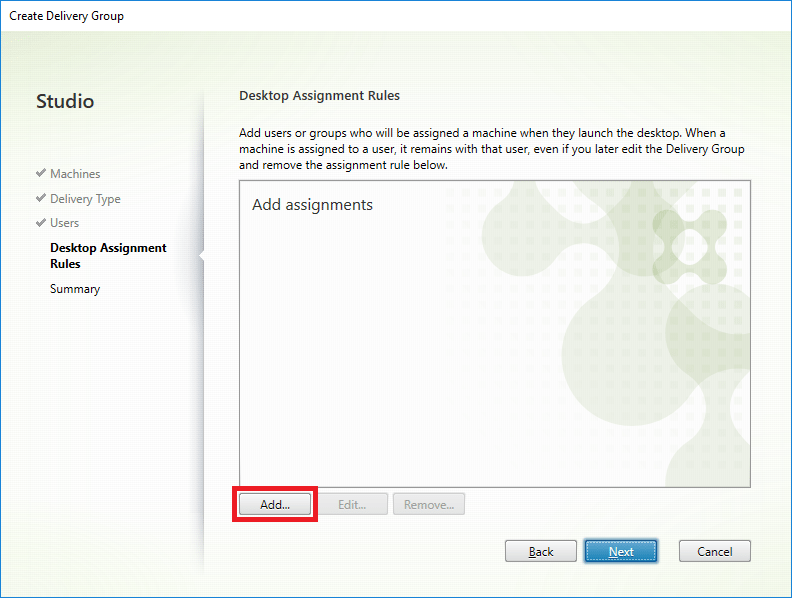 The page shown in Figure 85 allows you to create Desktop Assignment Rules (known as “Assignment policy rules” in PowerShell). These exist in earlier versions of XenDesktop, but were never shown in the UI – one was automatically created for applicable Delivery Groups. 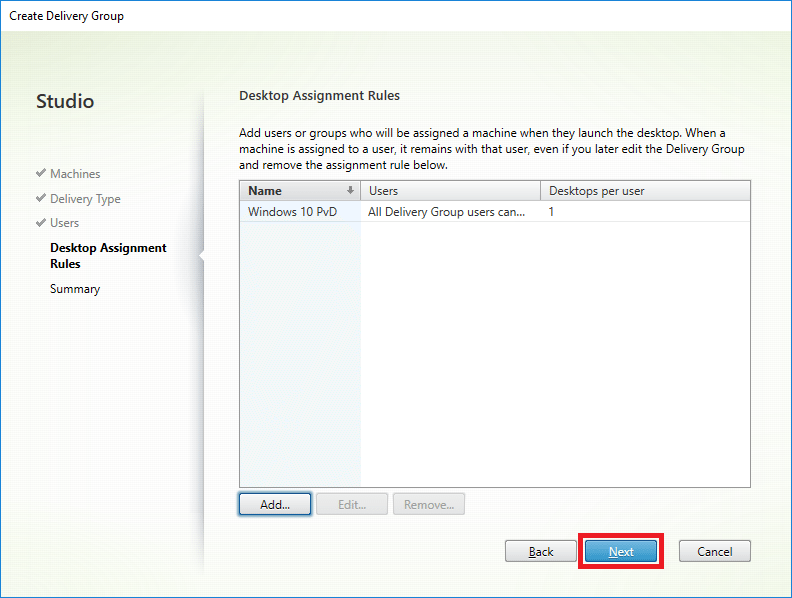 Desktop Assignment Rules define how users are assigned machines in the Delivery Group when they attempt to launch a desktop session for the first time (users that already have a machine assigned will use that one instead). Click Add… as shown in Figure 86. Because I restricted access to this Delivery Group to the LocalAdmins security group, and that group has only the users who need access to these desktops, I selected Allow everyone with access to this Delivery Group to have a desktop assigned. 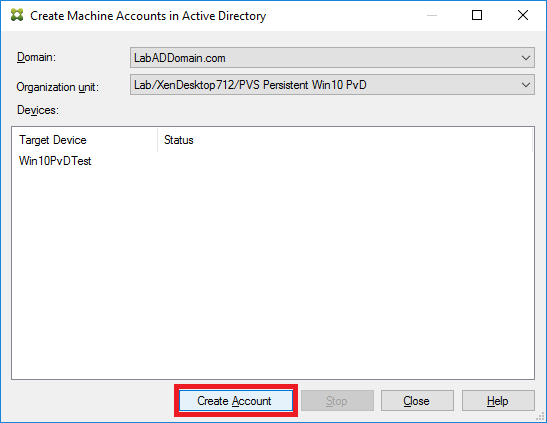 If you want to further restrict who has access to the PvD desktops, select Restrict desktop assignment to, click Add… and enter the user or users who should have access to the desktops. 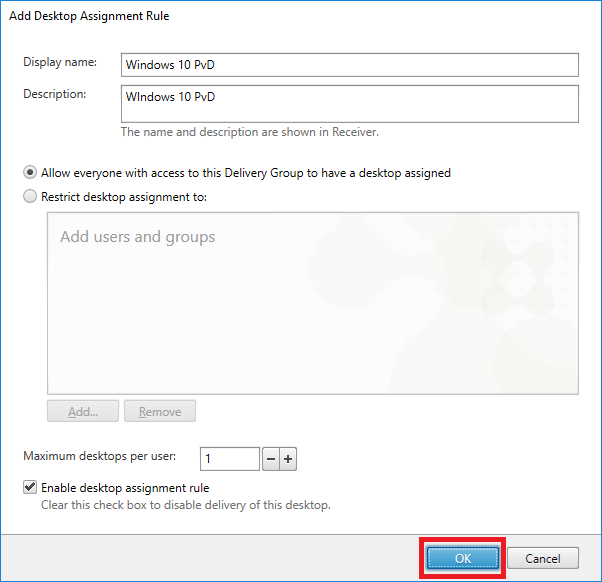 Enter a Display name, Description, Maximum desktops per user, verify Enable desktop assignment rule is selected and click OK as shown in Figure 87. Click Next as shown in Figure 88. 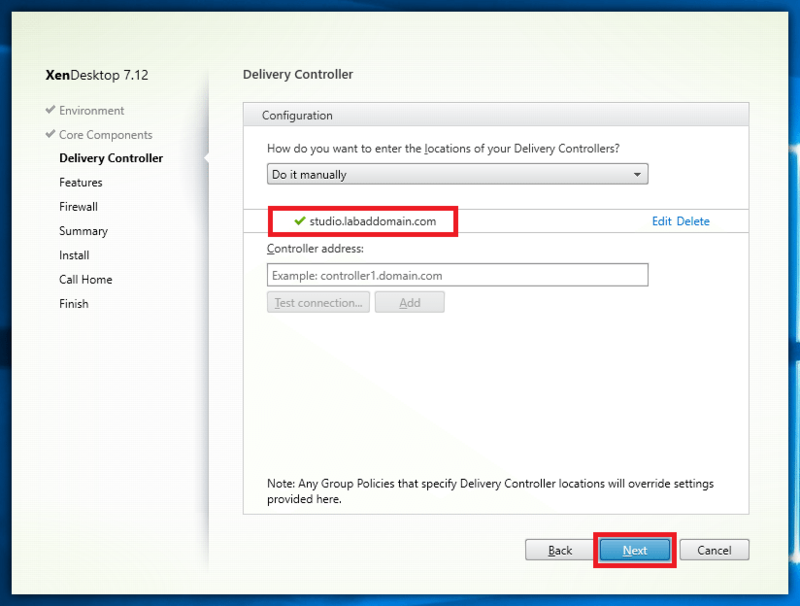 Enter a Delivery Group name, an optional Delivery Group description and click Finish as shown in Figure 89. From here, there are many options that can be configured. For this lab, I edited the Delivery Group and set both Weekdays and Weekend peak hours to 24 hours as shown in Figure 90. Note: I had a reader leave me a comment on the original article that said this setting does not apply to user assigned desktops. 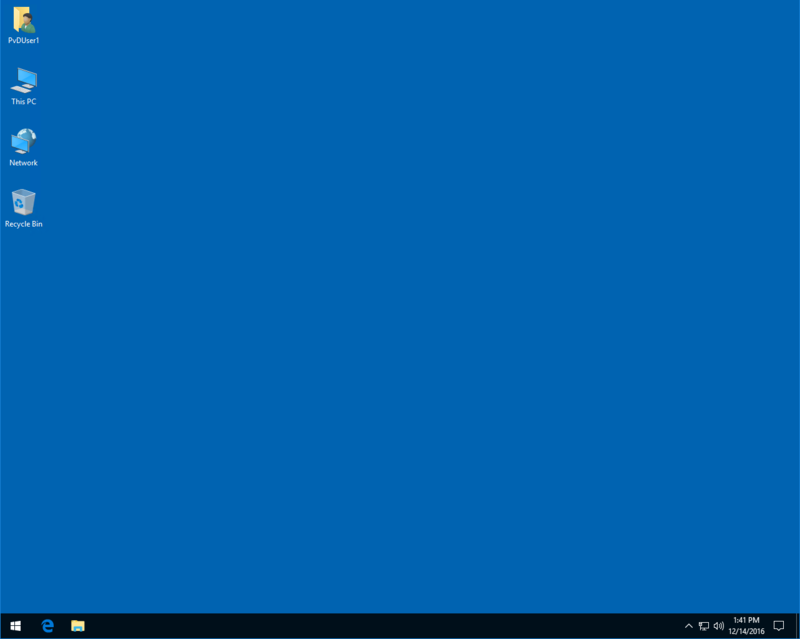 But, I never got more than one desktop to start (out of the three in my lab) until I set the PeakBufferSizePercent. 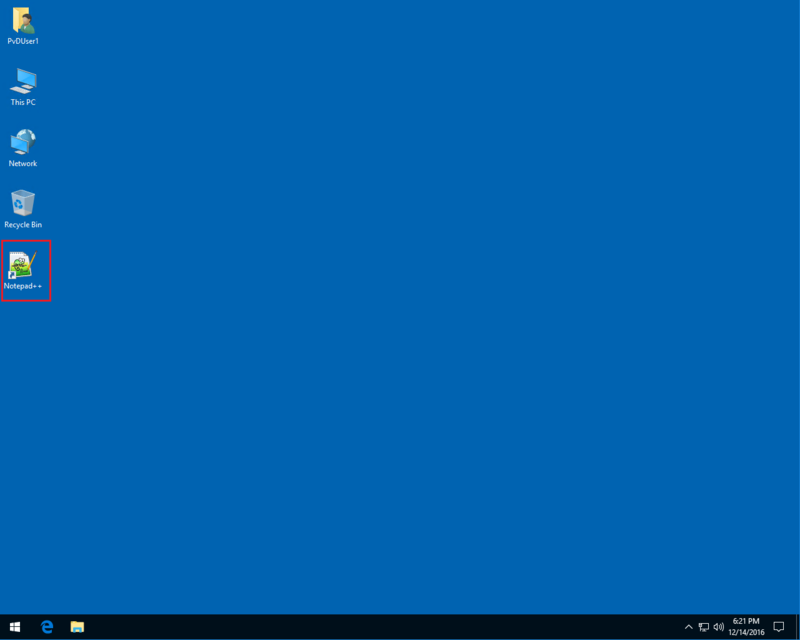 As soon as I entered that command, within a few seconds the other two desktops powered on. Exit the PowerShell session. After a few minutes, all the desktops will power on. The desktops will reboot, I think, two times before they are ready for users to login. Back in the PVS console, the vDisk will show three connections and all three target devices will be powered on as shown in Figures 92 and 93. Now let us look at how the Write Cache and PvD drives work. All three desktops are powered on. I will log in as a different user into each desktop. 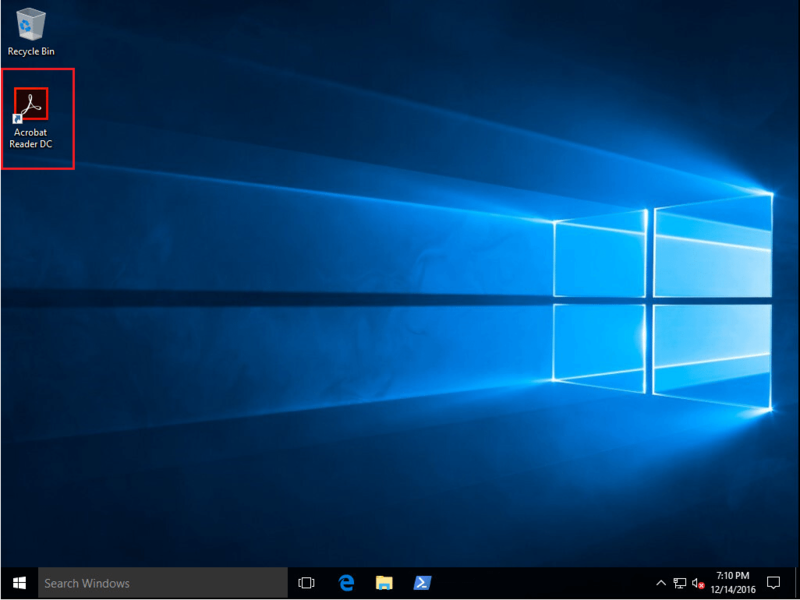 All three users are presented with the standard Windows 10 desktop configured during the creation of the master image VM as shown in Figure 94. Before we take a look at user customization and personalization, let’s see what is on the Write Cache and PvD drives. I had to show system and hidden files and operating system files. Figure 95 shows the Write Cache drive which shows the write cache file, page file and other files and folders. Figure 96 shows there is not much of anything useful to see on the PvD drive. 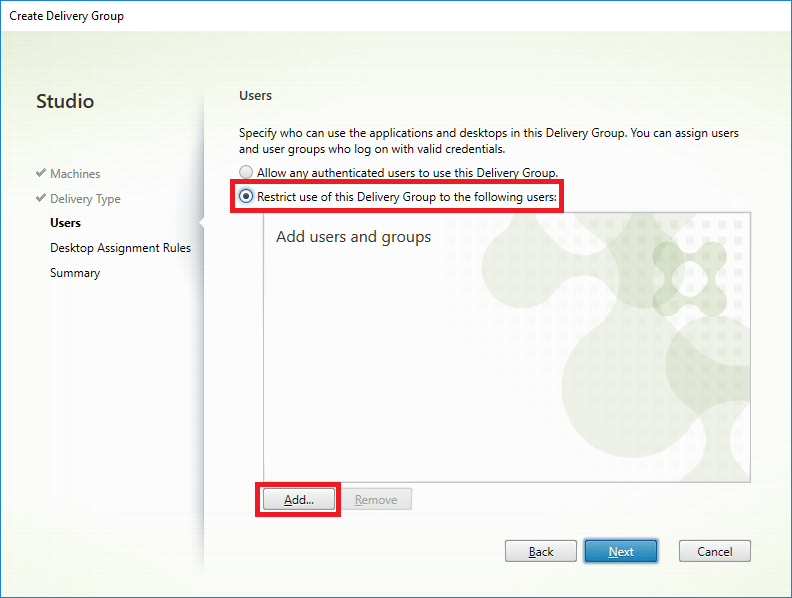 Back in Citrix Studio, refresh the Delivery Group and you will see there are now Sessions in use with no Unregistered or Disconnected machines as shown in Figure 97. Double-click the Delivery Group to see detailed information as shown in Figure 98. 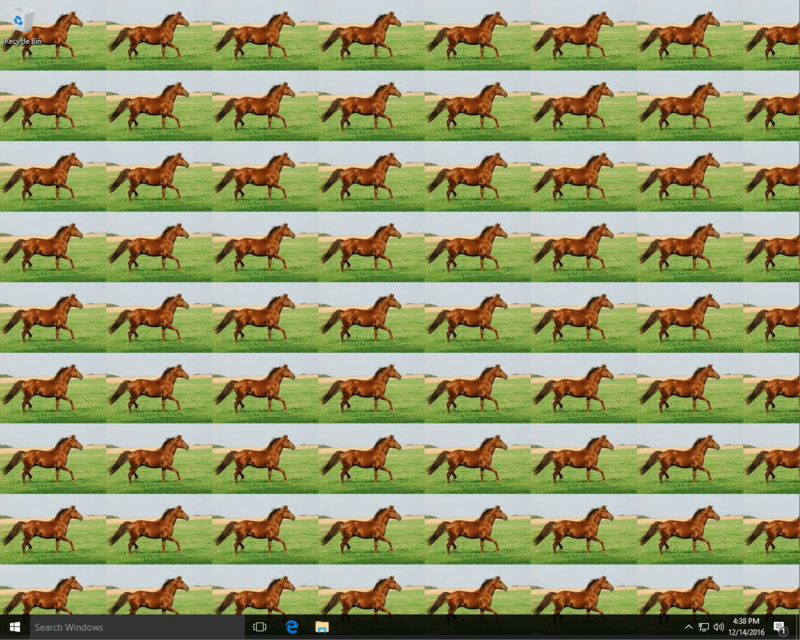 The first user configures her desktop to get all the Windows 10 “frilly” stuff out of her way as shown in Figure 99. The second user wants a pretty picture for her background as shown in Figure 100. 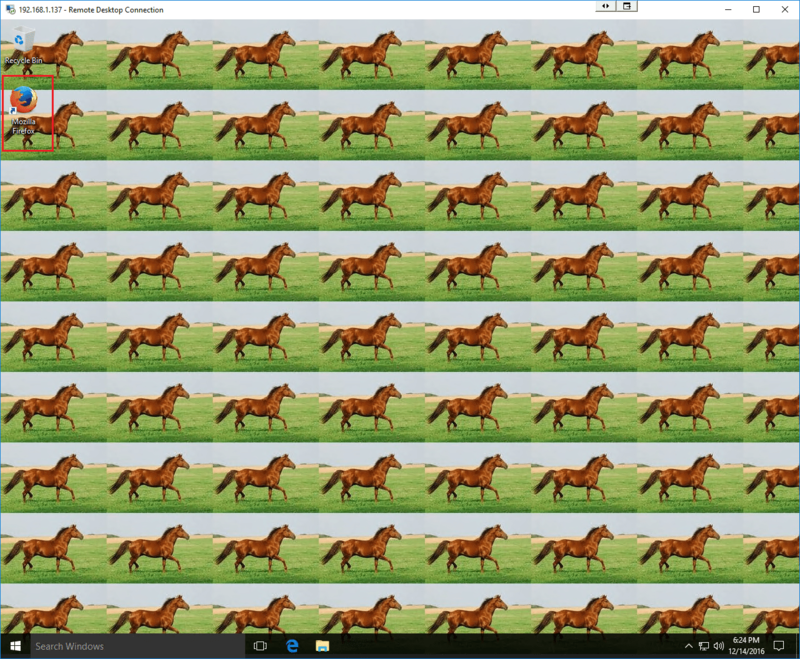 The third user needs a picture of her horse as her background as shown in Figure 102. Now that each user has customized their desktop, reboot each desktop, log back in to each desktop and verify the user’s customizations persisted. What about installing software? User1 installed NotePad++, User2 installed Google Chrome and User3 installed Firefox. The three desktops are shown in Figures 102 through 104. 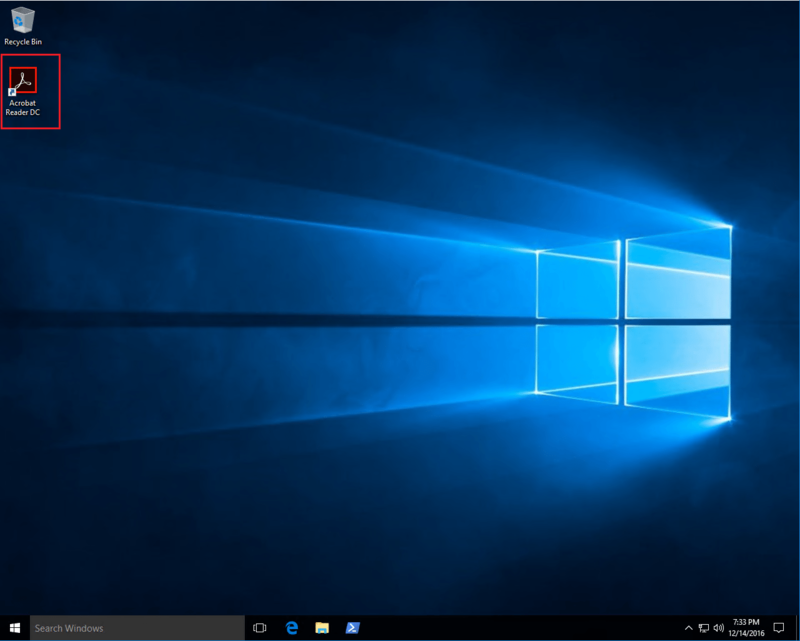 Now that each user has installed an application, reboot each desktop, log back in to each desktop and verify the user’s installed application persisted. 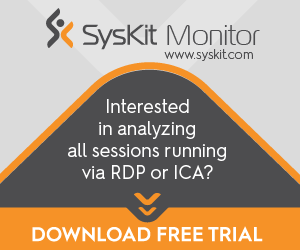 Since we are using PvD to allow users to install applications, where are the applications installed? 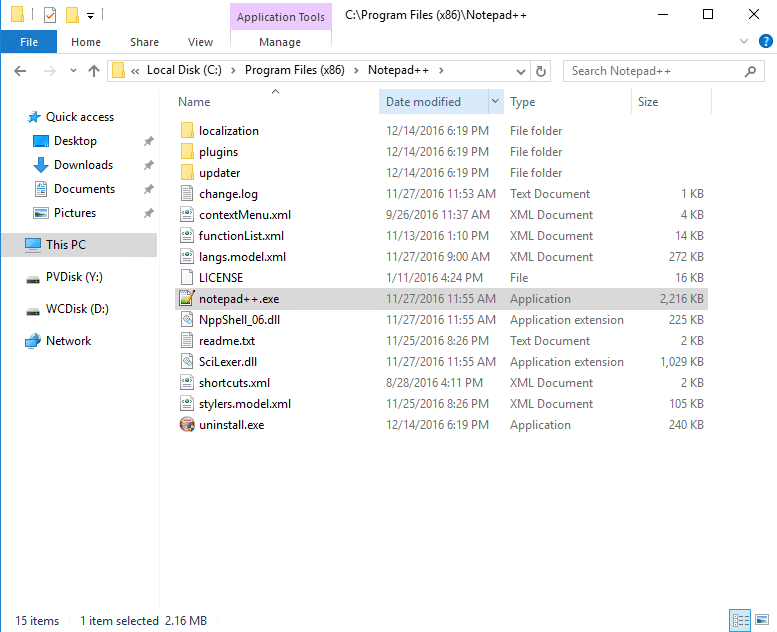 Looking at User1, we can see that Notepad++ was installed to c:\Program Files (x86)\Notepad++ as shown in Figure 105. 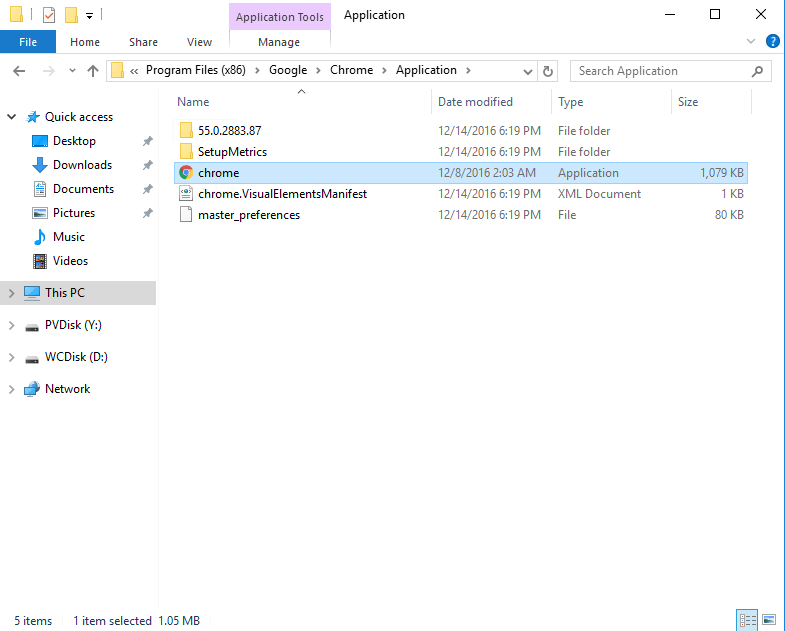 User2’s Google Chrome is installed to C:\Program Files (x86) \Google\Chrome\Application as shown in Figure 106. 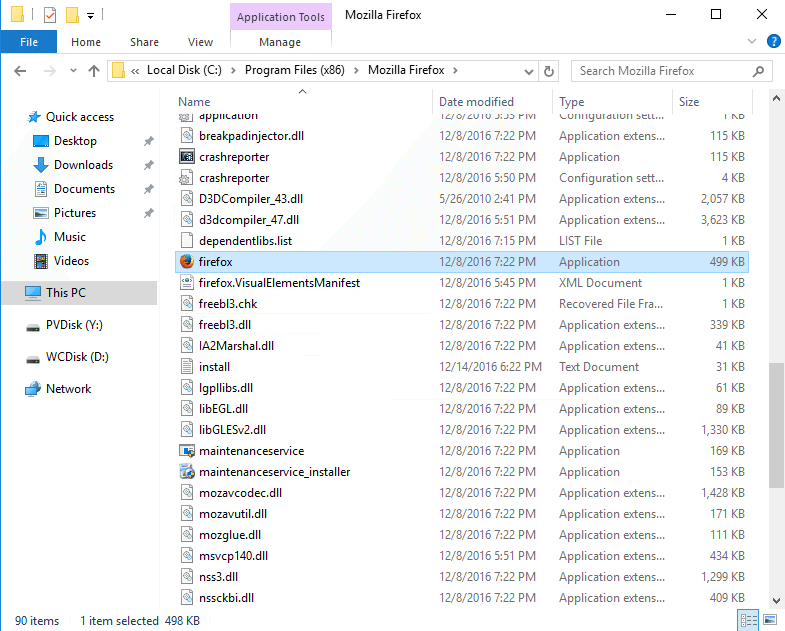 User3’s Mozilla Firefox is installed to C:\Program Files (x86) \Mozilla Firefox as shown in Figure 107. 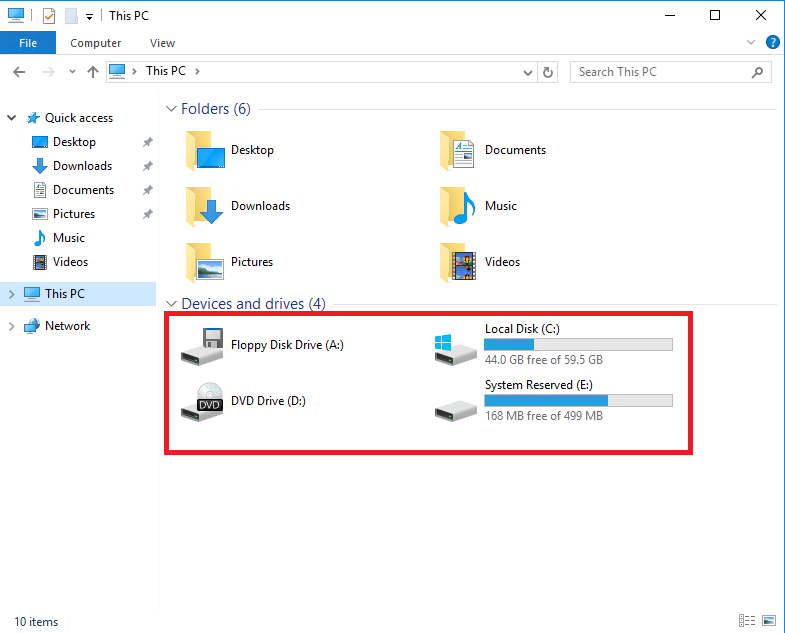 The C drive view is a combination of the hidden drive, V by default, and C. When users install applications they will install as usual to the C drive. There is no need to install to the visible PvD drive, P by default. 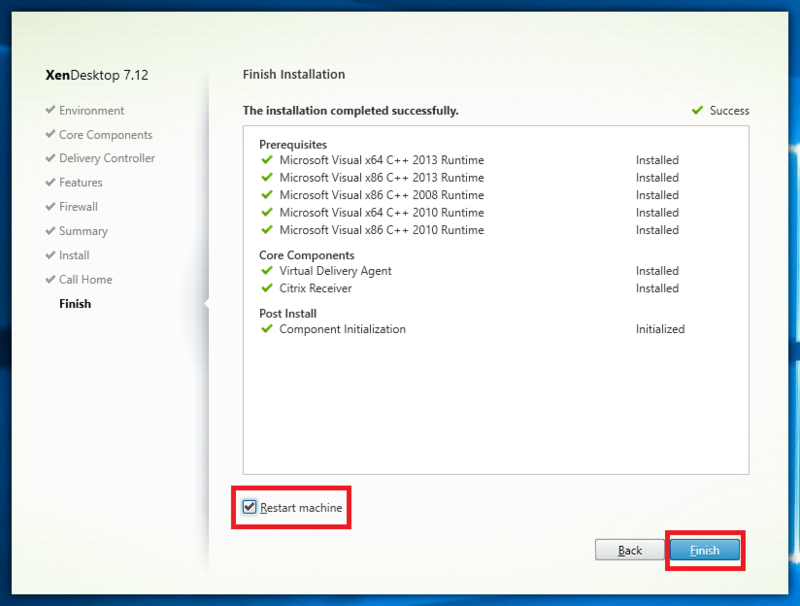 How is the master image updated if an application needs to be installed that all users need? 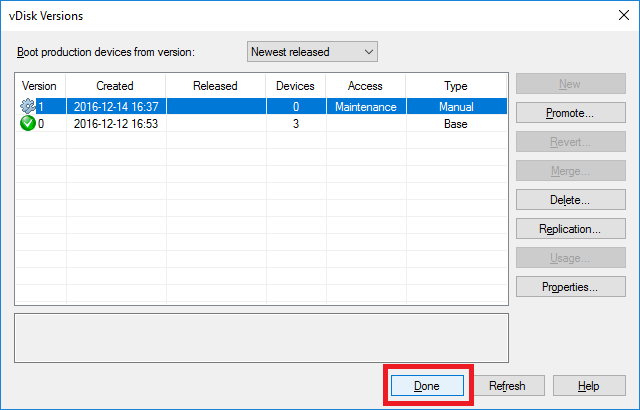 Simple, in the PVS console create a Maintenance version, update it, test it and then make it available to users. 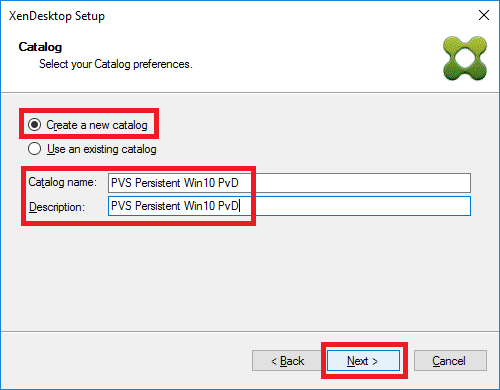 In the PVS console, right-click the vDisk and select Versions as shown in Figure 108. Click New as shown in Figure 109. A new Maintenance version of the vDisk is created as shown in Figure 110. Click Done. 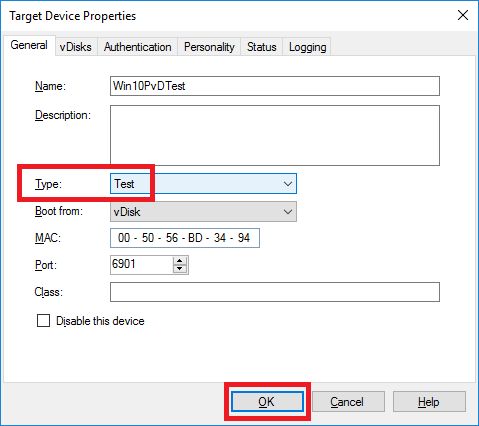 In the PVS console, go to the Device Collection the original master target device is in, right-click the target device and click Properties as shown in Figure 111. Change the Type from Production to Maintenance and click OK as shown in Figure 112. Note: In a production environment, you would have a dedicated Target Device to use for Maintenance versions of vDisks. In the hypervisor, start that VM and open the VM’s console. 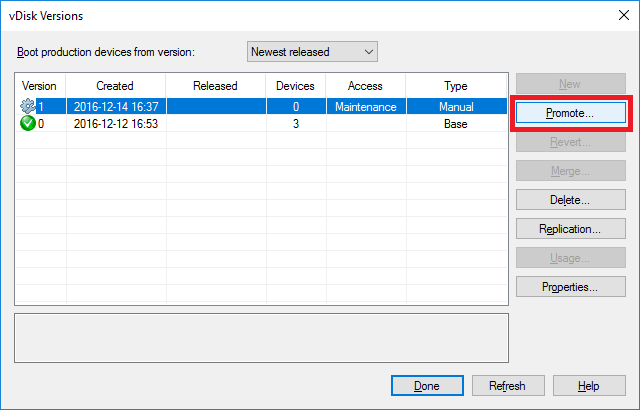 An option to boot into either the Production version or the Maintenance version is shown. Select the Maintenance version as shown in Figure 113. 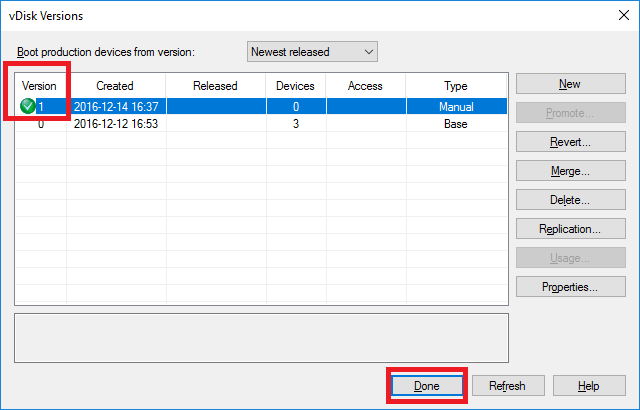 Note: There is a registry key that can be set on each PVS server to have the first menu item accepted by default. Please see Setting vDisk Boot Menu as a Default Option. What has happened is that the target device has been configured to boot from a Maintenance image and during the bootup communication, the PVS server recognized the MAC address and offered the target device the maintenance vDisk to boot from. 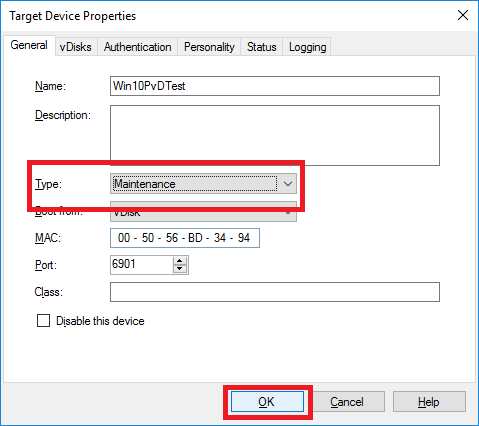 The maintenance vDisk is in Read/Write mode so changes can be made to the vDisk. 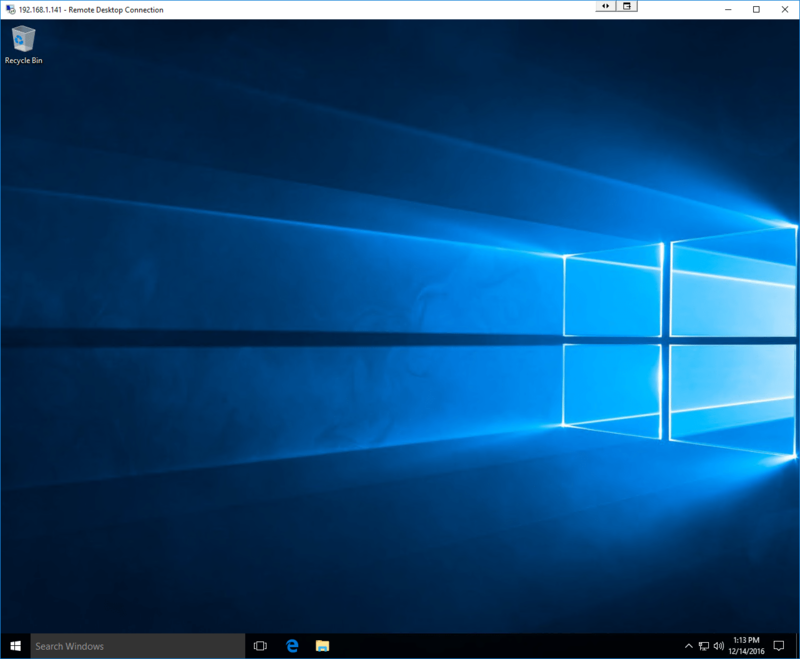 Login to the desktop with domain credentials. I installed Adobe Acrobat Reader as shown in Figure 114. 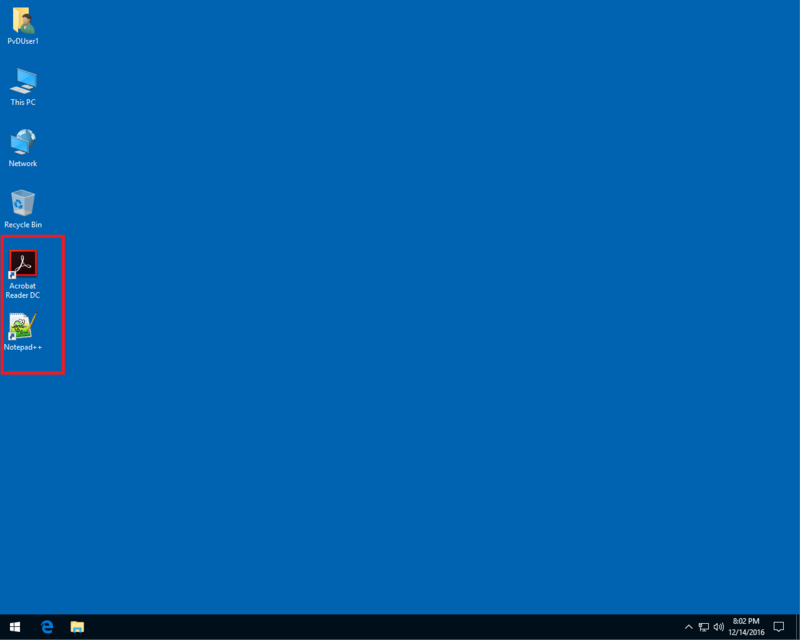 Since this is Windows 10, this would also be a good time to make sure any Windows updates are installed. Note: Whatever software is installed, verify that any license agreements and popups are acknowledged and any other configurations needed are done before sealing the image and running the PvD Inventory. For example, in Acrobat Reader I set Acrobat Reader to be the default app for PDFs. 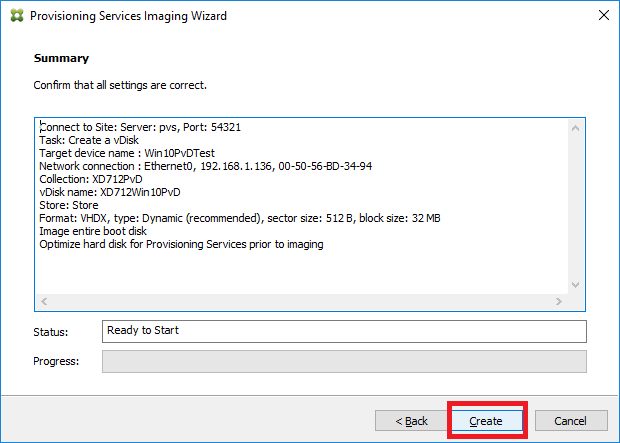 Before running the PvD Inventory, follow your standard procedure for sealing the image. This process is unique to every environment. For my lab, I have no antivirus software and I am not using WSUS so I have no registry keys to clear out. Note: Do NOT touch KMS. There is no need to rearm either Windows or Office (if installed). Manually run the PvD Inventory. 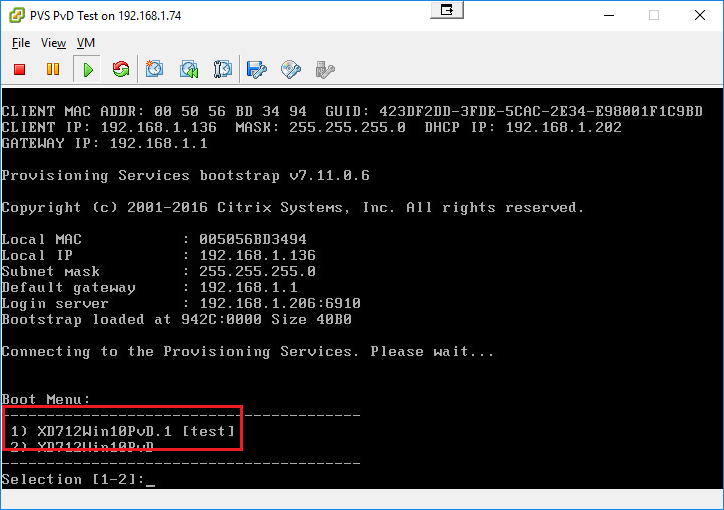 Click Start, Citrix, Update personal vDisk as shown in Figure 115. The PvD inventory starts. Leave Shut down the system when update is complete selected as shown in Figure 116. Note: If Windows Updates were installed, it could take a very long time for the inventory update to run. After the inventory completes, click Yes to shut down the VM as shown in Figure 117. Once the VM has shut down, in the PVS console, right-click the vDisk and select Versions as shown in Figure 118. Select the Maintenance version and click Promote as shown in Figure 119. PVS 7.6 added the ability to have a Test version for a vDisk that uses PvD. This was not possible prior to version 7.6. Select Test and click OK as shown in Figure 120. The vDisk version is promoted to Test, as shown in Figure 121. Click Done. 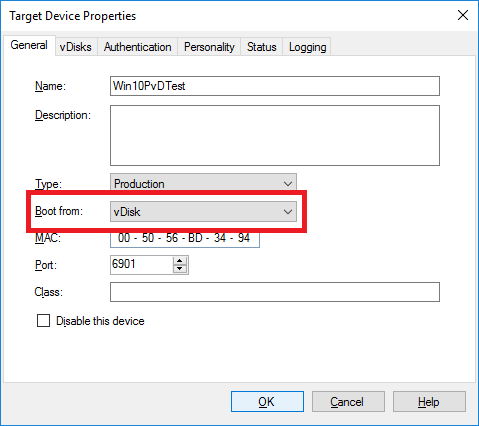 In the PVS console, go to the Device Collection the original master target device is in, right-click the target device and click Properties as shown in Figure 122. Change the Type from Maintenance to Test and click OK as shown in Figure 123. Note: In a production environment, you would have dedicated Target Devices to use for Test versions of vDisks. In the hypervisor, start that VM and open the VM’s console. An option to boot into either the Production version or the Test version is shown. Select the Test version as shown in Figure 124. There is no PvD drive attached (also Figure 130). Once testing is completed, shutdown the VM. Note: If you get prompted to update the PvD inventory, you can safely cancel the popup or select Shut down anyway. The vDisk is in read-only mode so no updates can be made or saved. 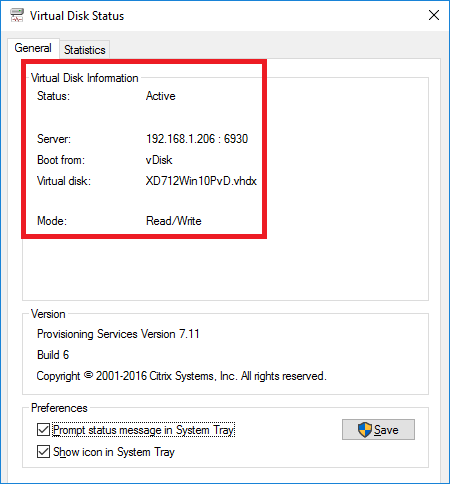 Once the VM has shut down, in the PVS console, right-click the vDisk and select Versions as shown in Figure 130. Select the Test version and click Promote as shown in Figure 131. Select Immediate and click OK as shown in Figure 132. The updated vDisk is now available for use as shown in Figure 133. Click Done. Restart the desktops for them to start using the updated vDisk. The desktops will automatically reboot after a few minutes. This is normal. Wait until this reboot is complete before allowing the users access to the desktop. In my lab, this took a very long time before the desktops were ready for use. Log in to each desktop and verify the new application is available and the user’s original customizations and installed applications persisted after the update. 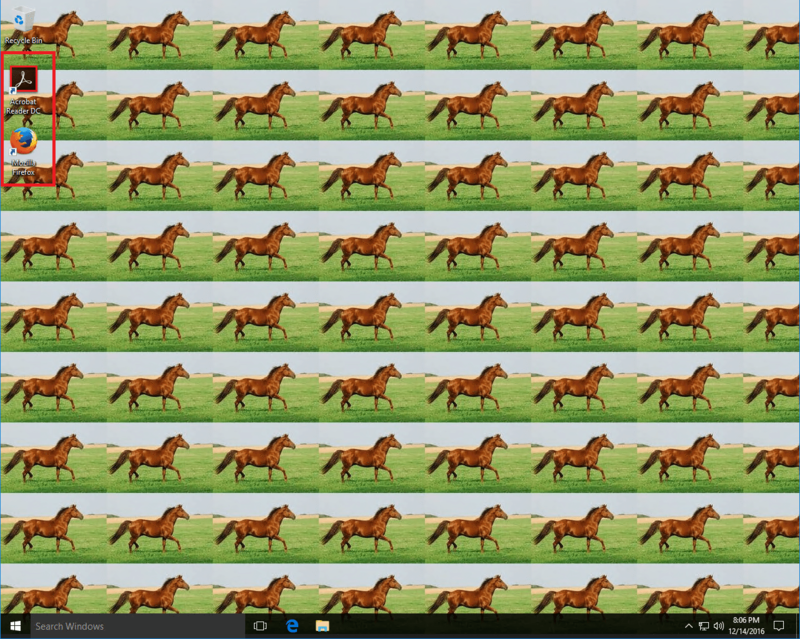 The three desktops are shown in Figures 134 through 136. 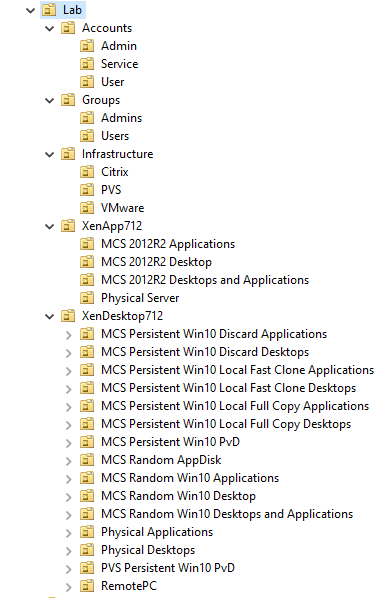 And there you have it, one way to do a XenDesktop 7.12 with Personal vDisk process. 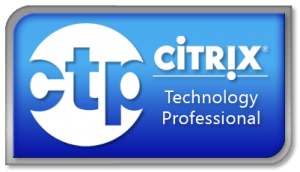 Citrix lists four ways to do this process in the product documentation, three with PVS and one with MCS. I think it is strange they have MCS listed as a process in the PVS documentation but that is beside the point. 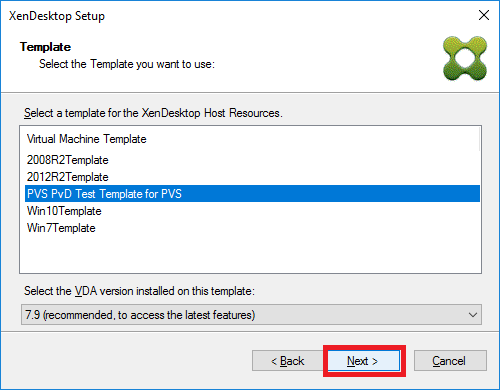 I hope this detailed process explanation will help you in working with PvD with XenDesktop 7.12 and PVS 7.11. Hi Carl, excellent and detailed article as always. My question is on the drive configuration for the writecache and PvD disks. In your previous article (XD/PVS 7.7) you laid out adding in VMware and configuring but not formatting the 2 drives, that were later formatted when running the XD Setup Wizard (set to D: and P: and apparently formatted via the wizard). There’s no mention of adding the drives in this version. So my question is – is that step no longer required? Do I just configure a VM with an OS disk and the XenDesktop Setup wizard will take care of the other drives when running? The previous version also would have had the template created with the additional drives, where this version appears to not have or care, assumable that it adds them during the wizard process. Thanks for your time in responding. The original article was based on a specific customer who wanted the drives on specific storage. When you use the wizard, all drives are placed in the same storage. Not always a viable solution for large deployments. Unfortunately, I have not seen this and a Google search didn’t turn up anything. I would suggest asking this on the Citrix support forums. That is either a DHCP misconfiguration, the wrong info entered in the wizard or a firewall issue. If you search on “citrix pvs tftp timeout”, you will find a lot of hits on that specific issue. 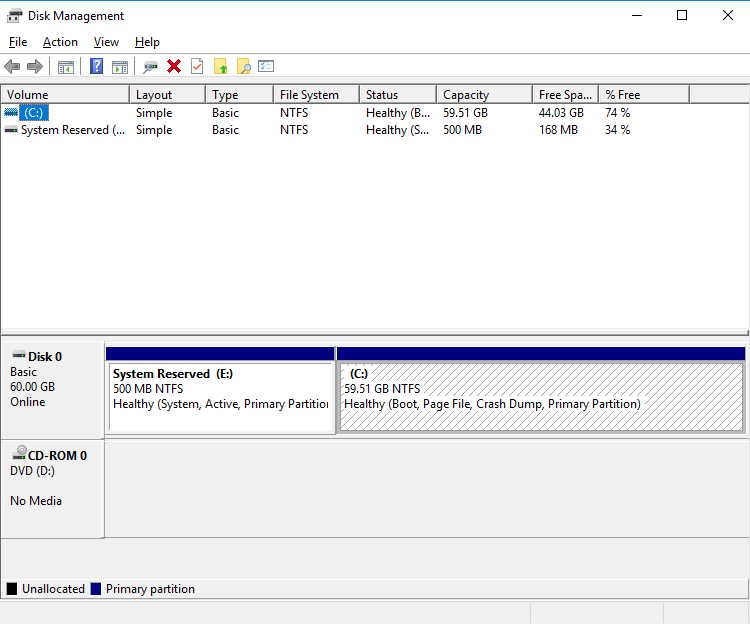 Regards to Pvd – is there a way to clone a personal vDisk in XenCenter. So it can save me time installing the same set of applications for another user. As far as I know, that is not possible. The PvD disk is tied to the user who logged in to it and the VM it is associated with. You could try it but I doubt it would be supported and it would cause you more time and trouble than you are trying to save. As I state at the end of the article, there are four ways to handle this. One is for MCS and three are for PVS. Each option is explained at the link above.